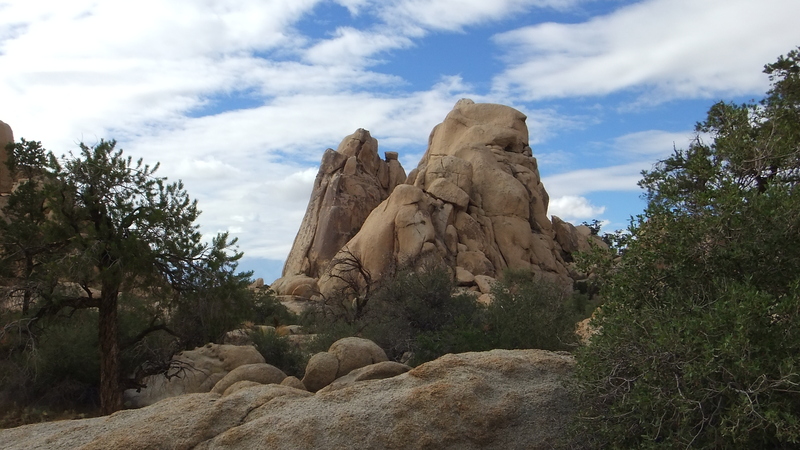 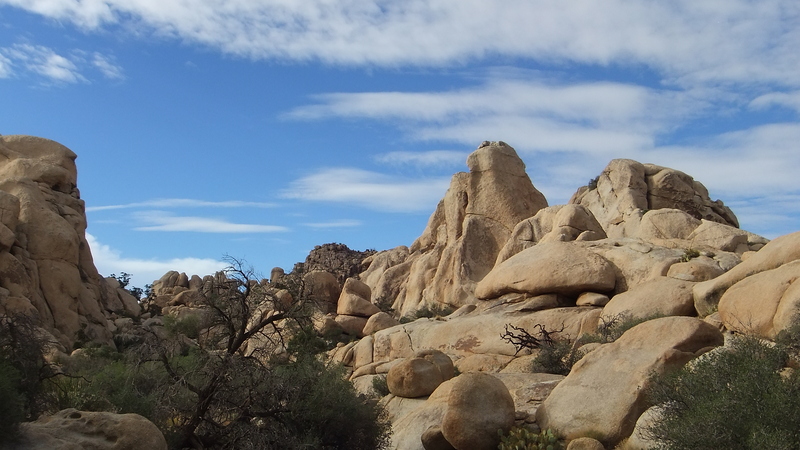 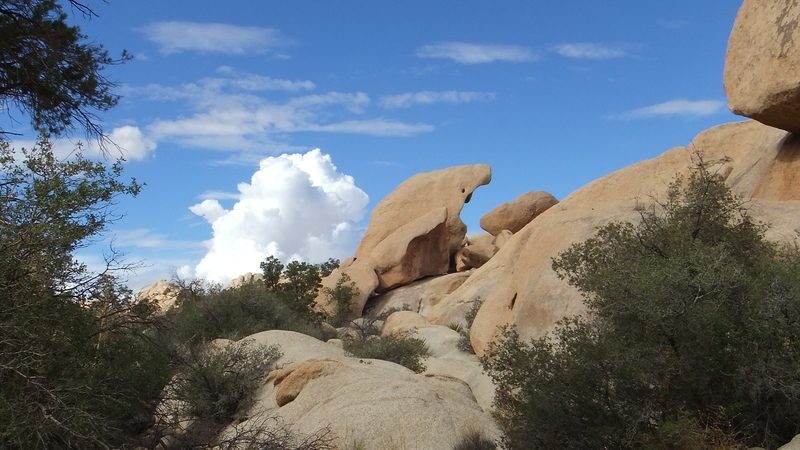 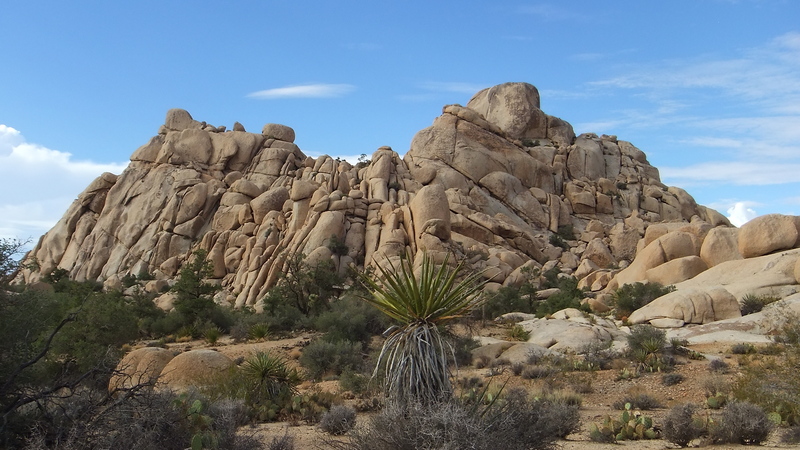 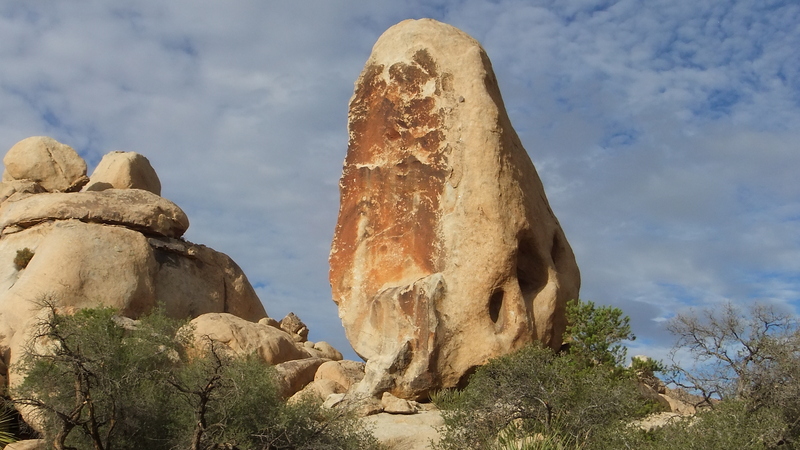 OUR DAY BEGAN with a 3-hour trek out to Samuelson’s Rocks, about 4 miles round-trip when you count the zigging and zagging that diehard wayfarers and wanderers in Joshua Tree find enjoyable. 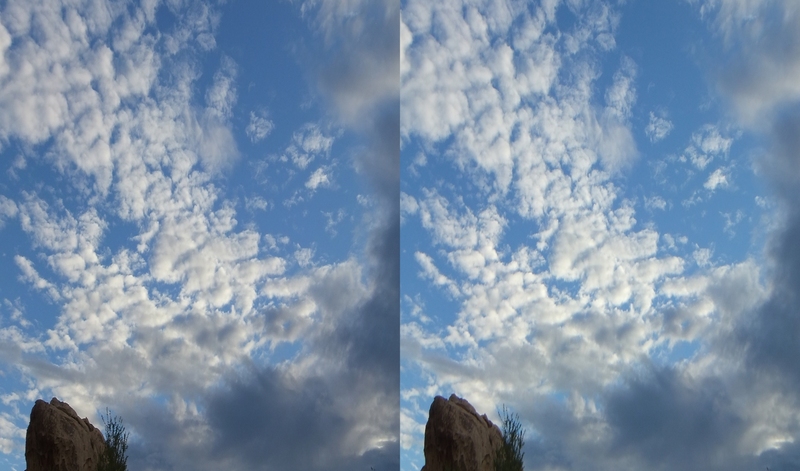 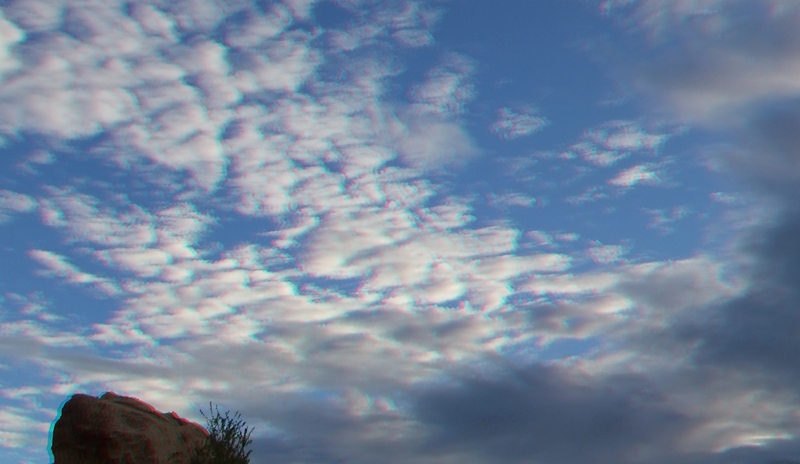 With the sun having broken through thick cloud cover by afternoon, the skies were blue with nice puffy clouds, the temperature a bit on the warm side at 79F, and the humidity feeling like elephants weighing on our shoulders. 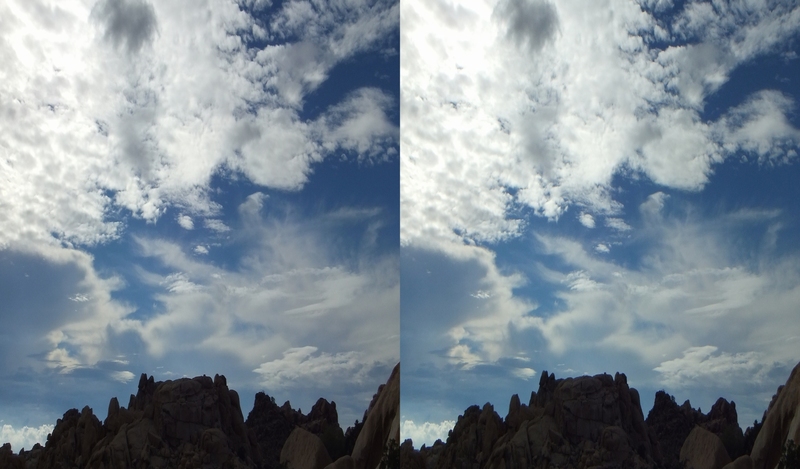 Heavenly conditions! 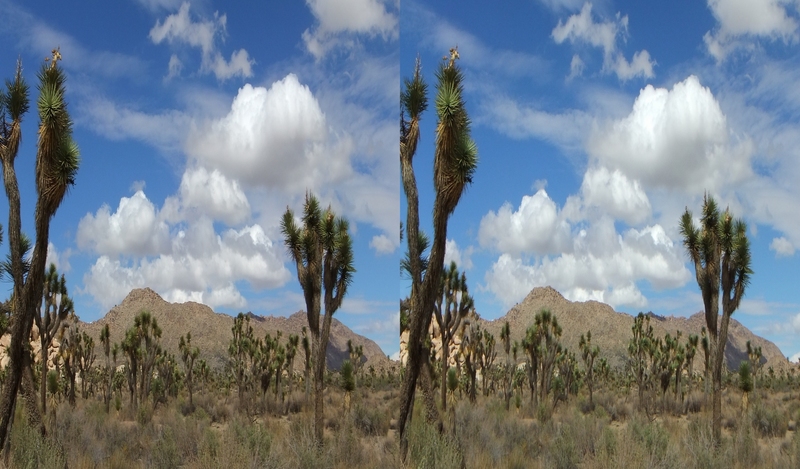 This was, after all, late August in the Southern California desert. 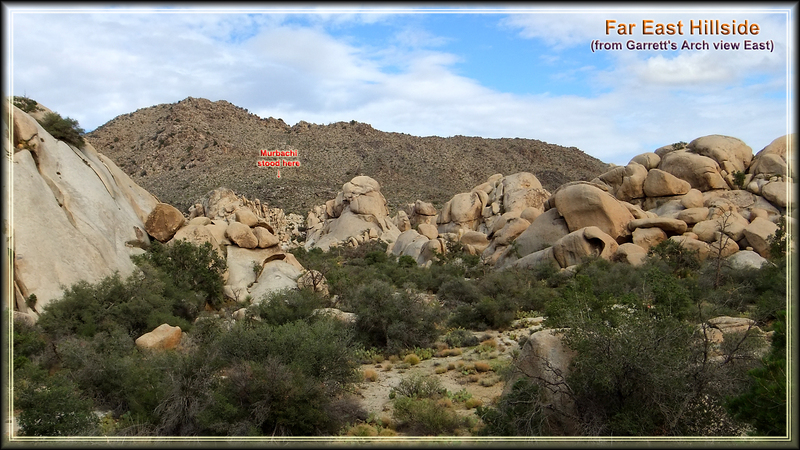 Admittedly, the 4,300ft elevation lessened somewhat what would otherwise be a devilish, 105F+ hike had it been undertaken in the Coachella Valley (Palm Springs) twenty miles to the west. 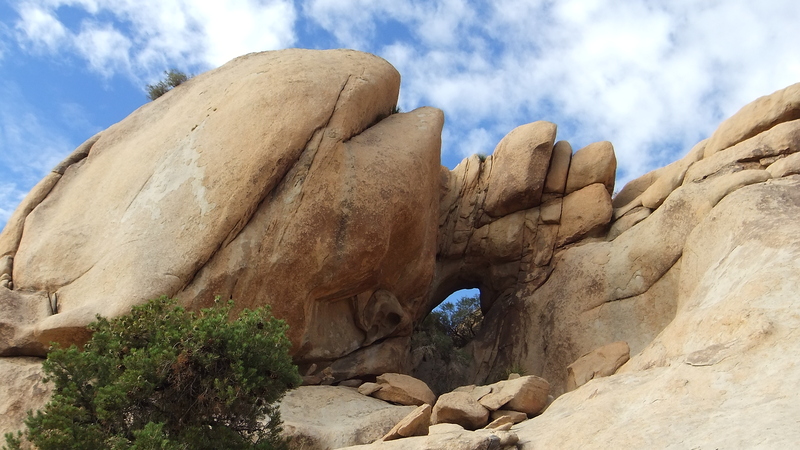 According to Cali49’s mobile phone App, we traversed approximately 4-1/2 miles to Garrett’s Arch and back, “on our fairly direct path, which included a little wandering around for photos and a wee bit of backtracking.” Hence, 3-1/2 hours. 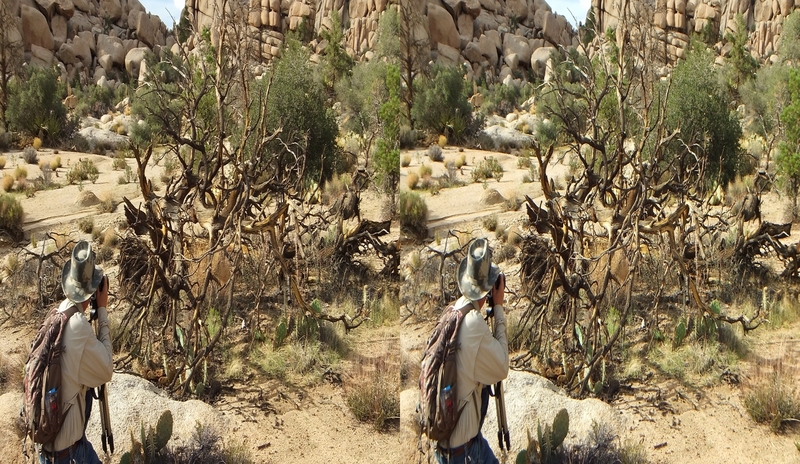 “The hike could definitely be made in less time by those on a mission, or it could be lengthened into an entire day trip as there is so much to do and see along the trail to Garrett’s Arch.” As the photos show in this section and the other Wonderland Valley Galleries, there are countless shady pinyon pine trees under which one can stop to quench your thirst and have a snack. 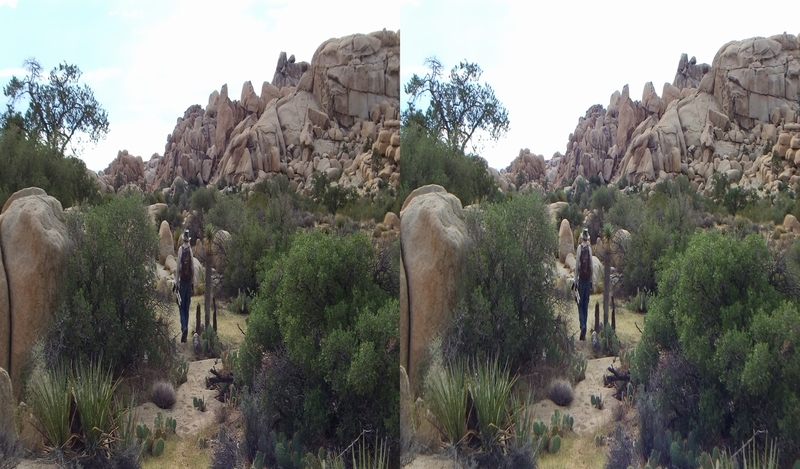 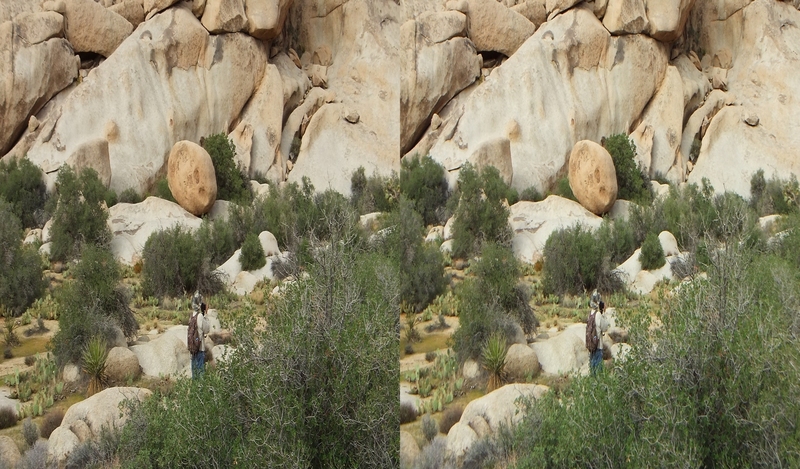 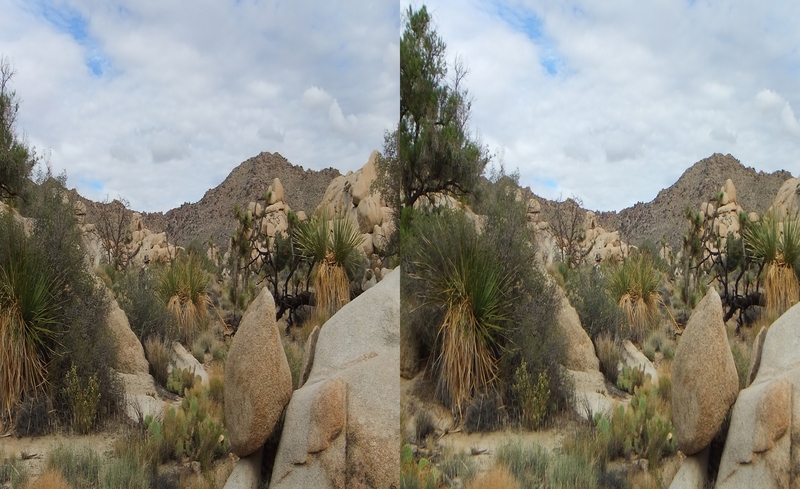 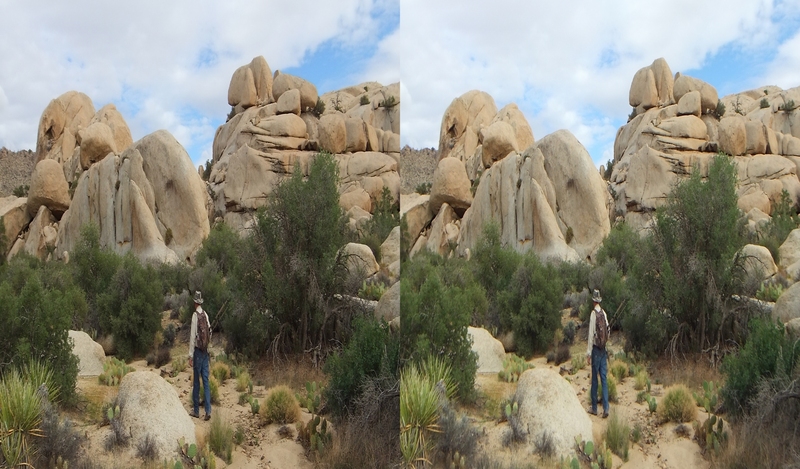 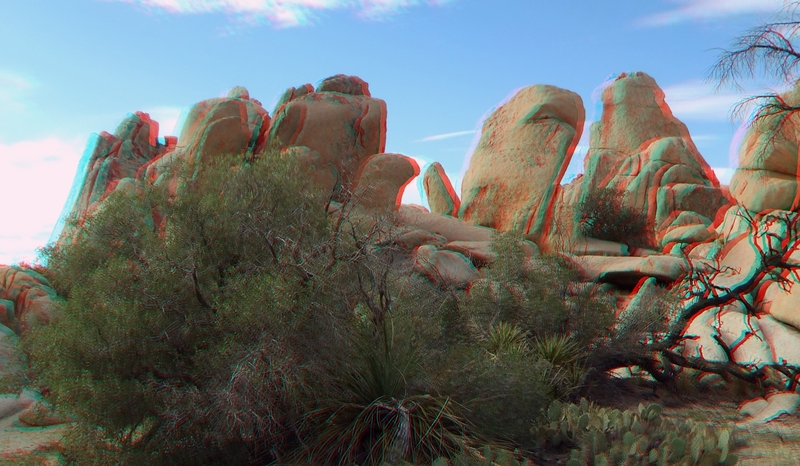 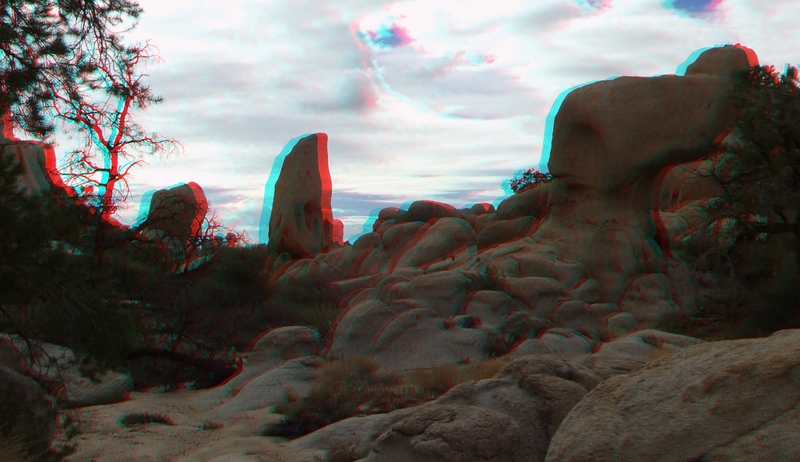 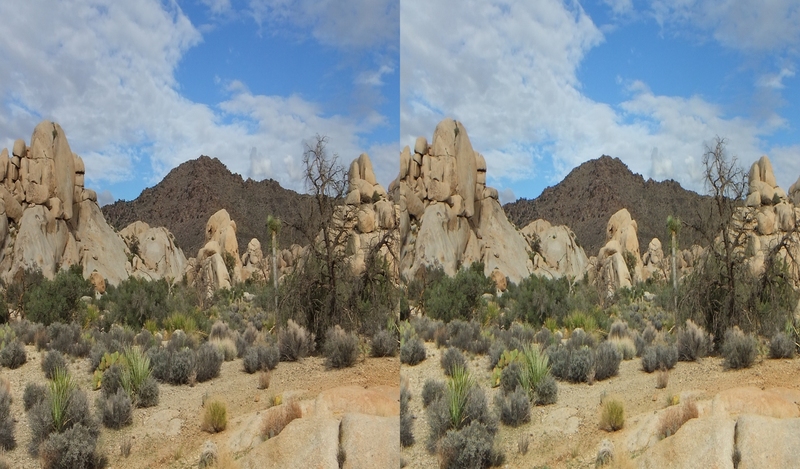 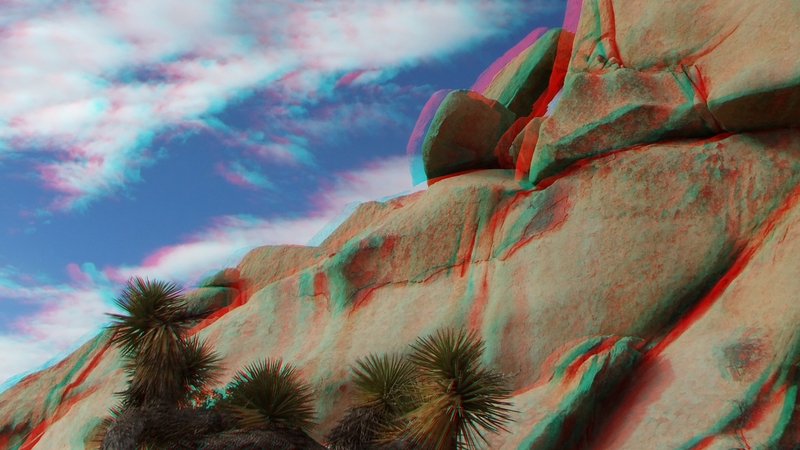 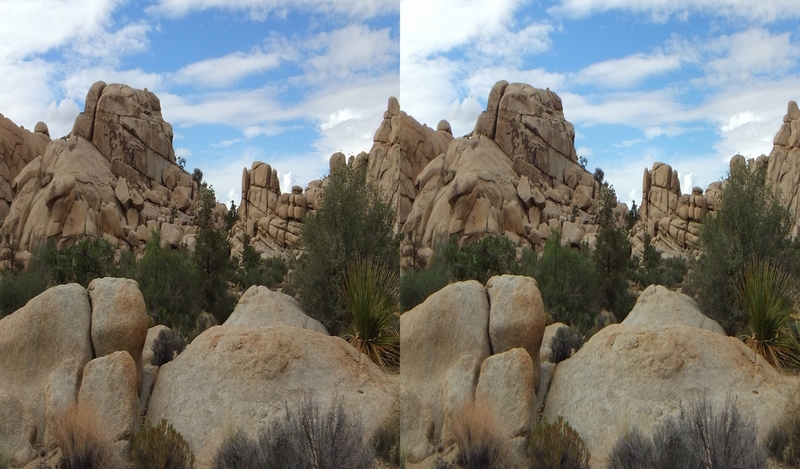 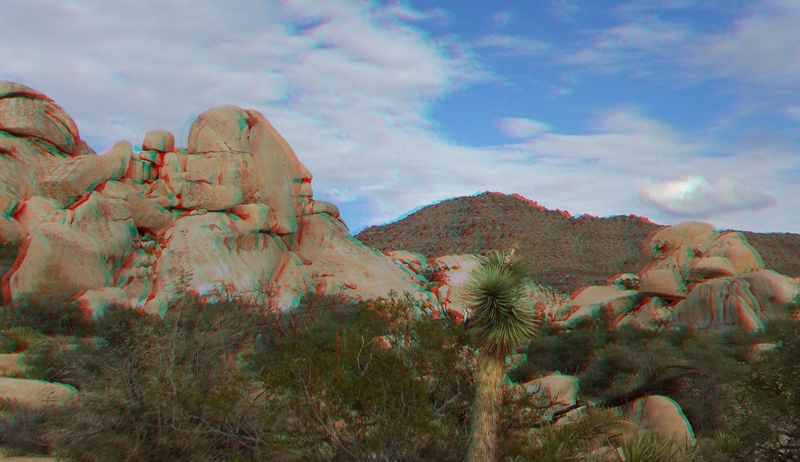 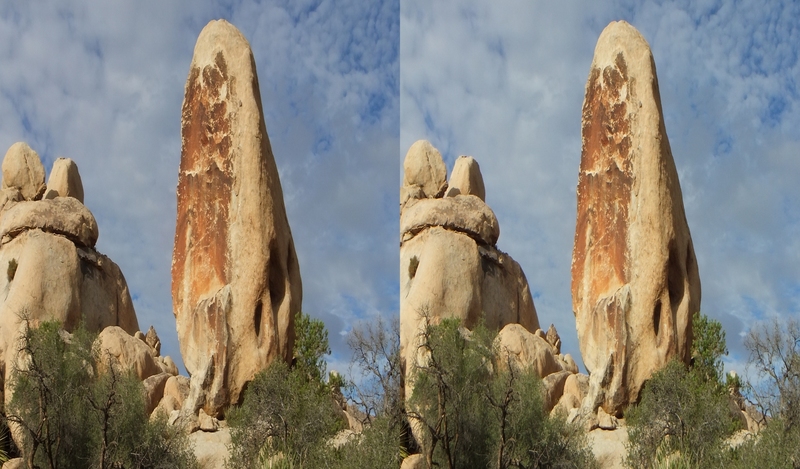 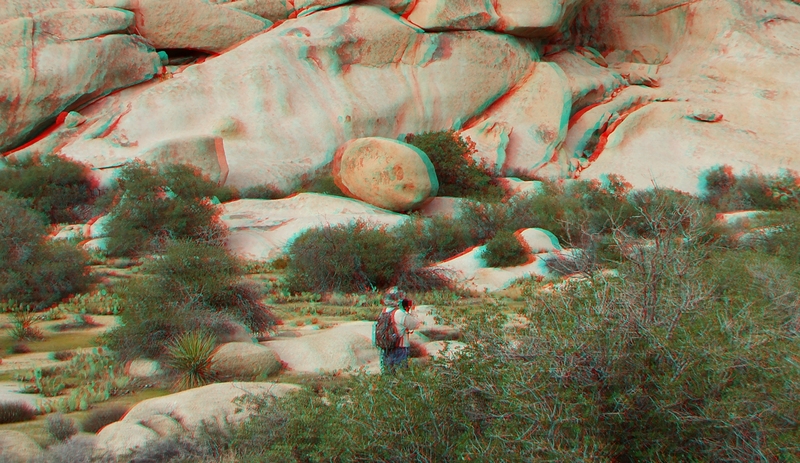 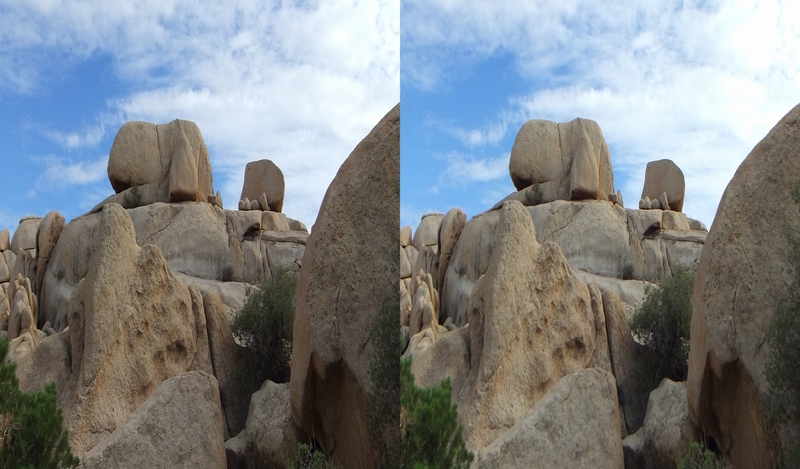 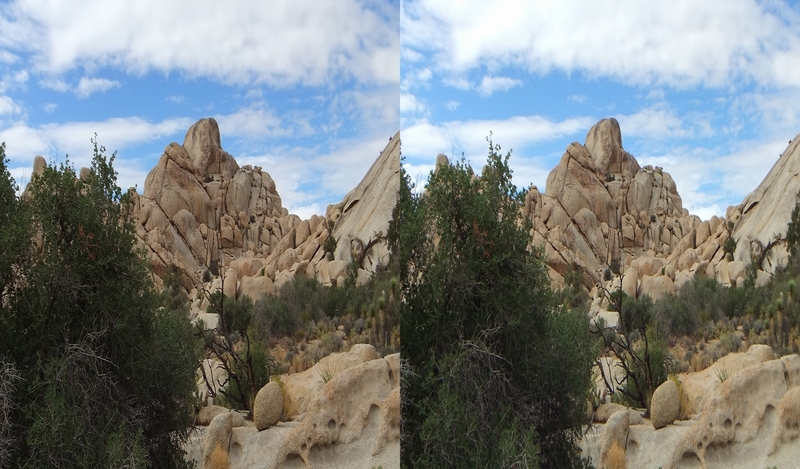 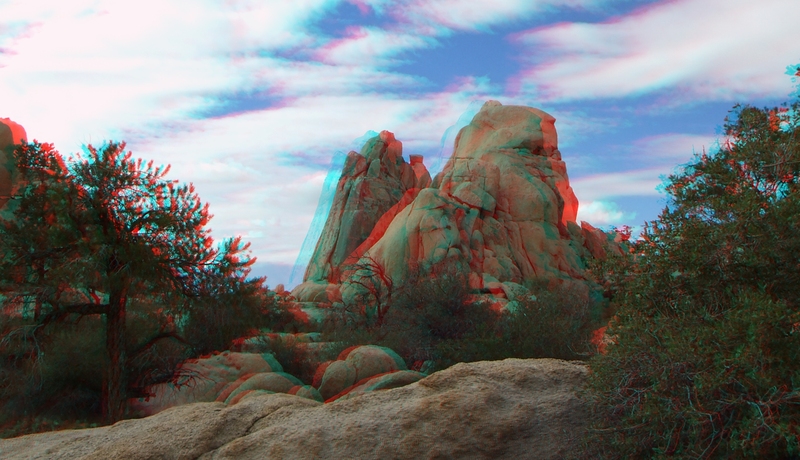 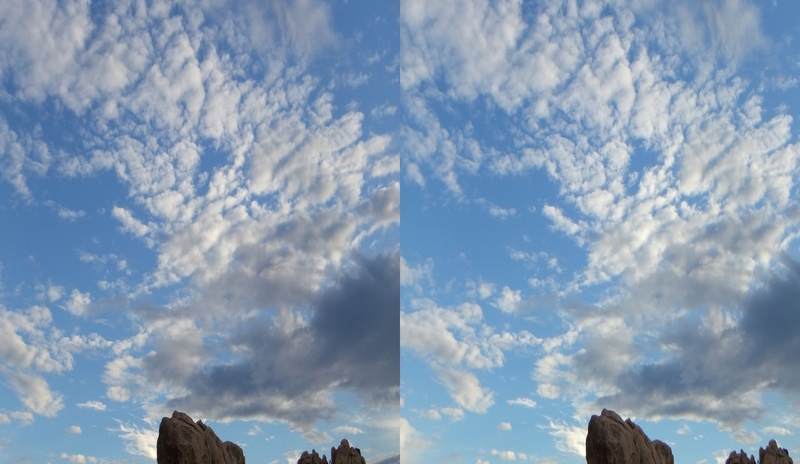 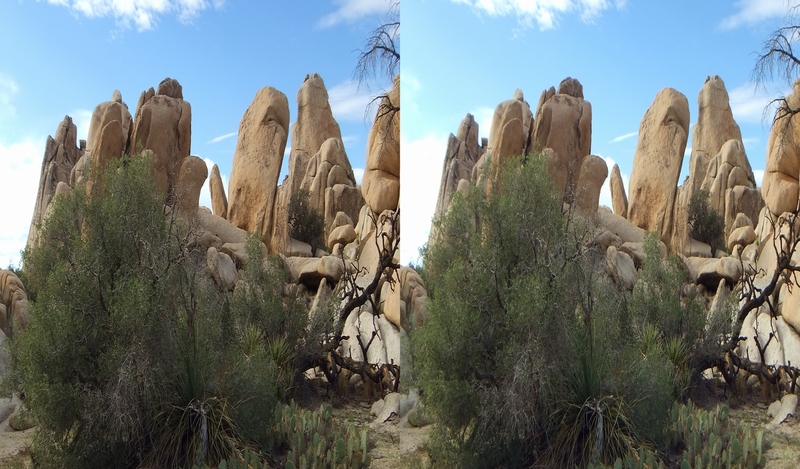 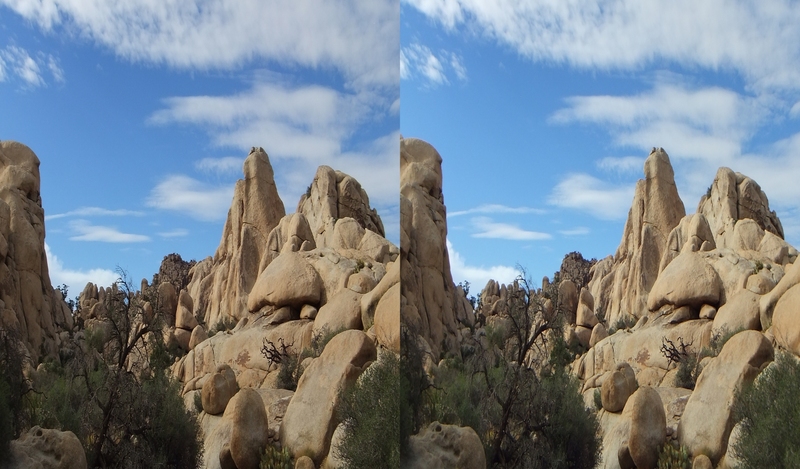 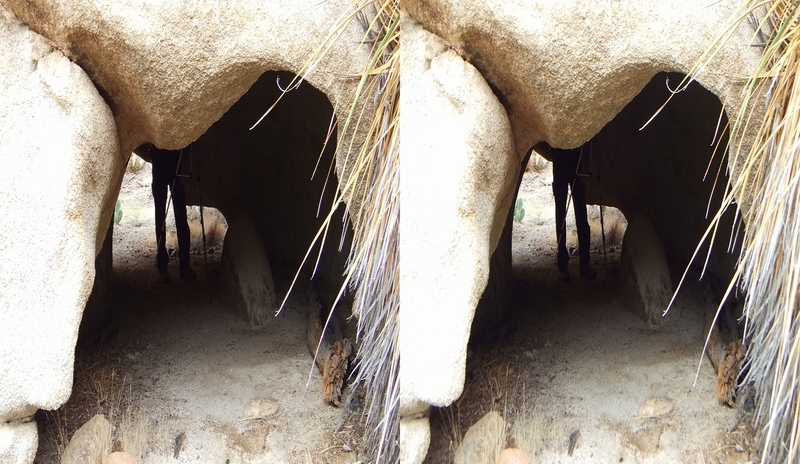 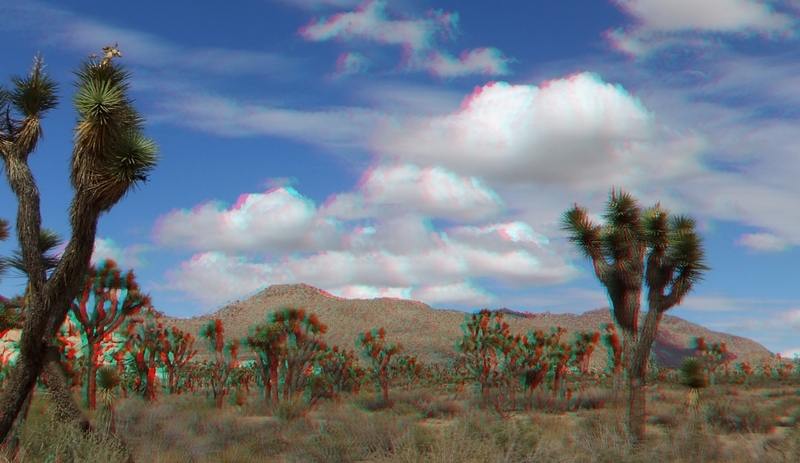 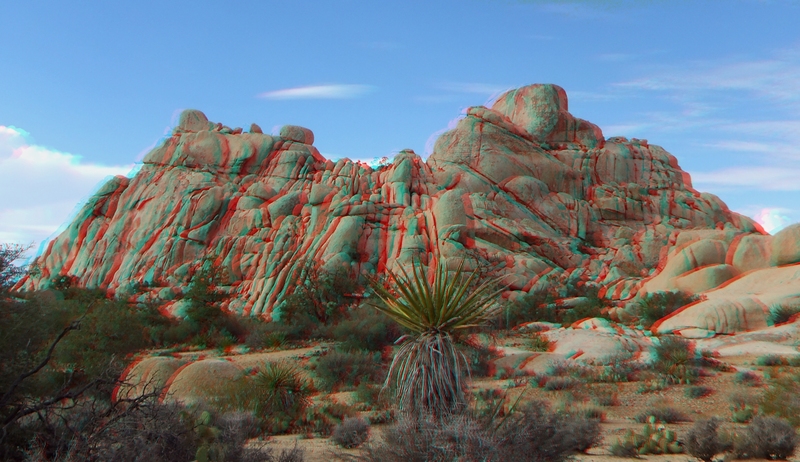 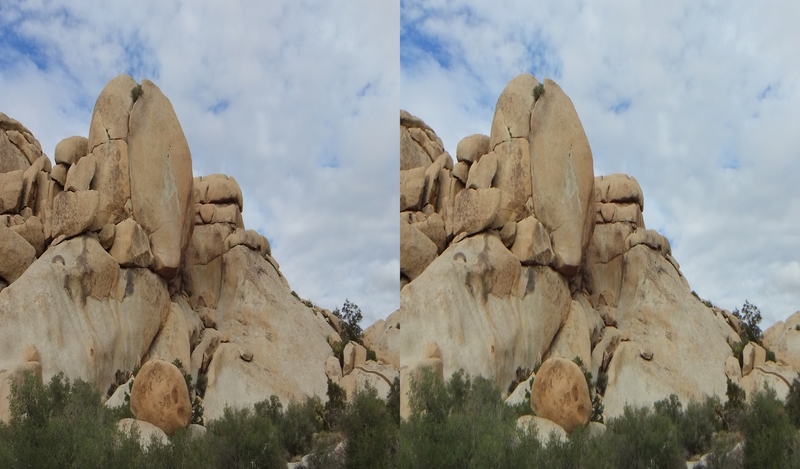 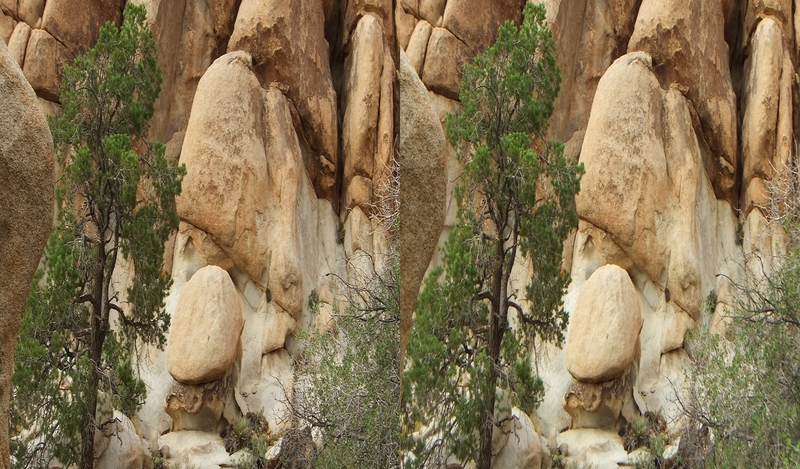 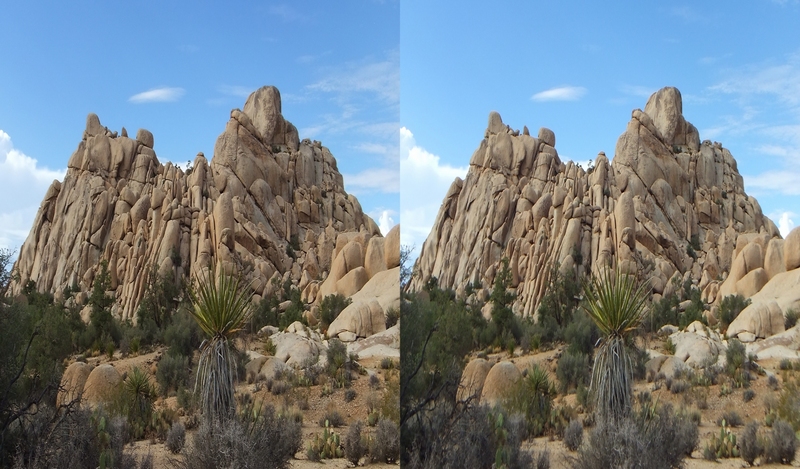 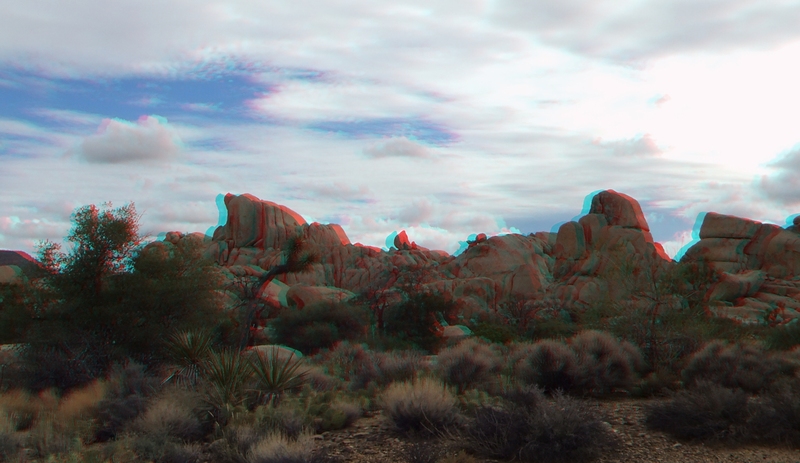 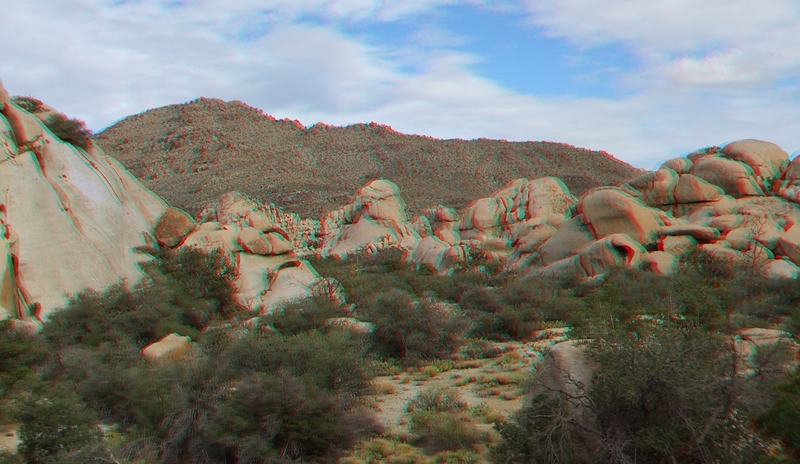 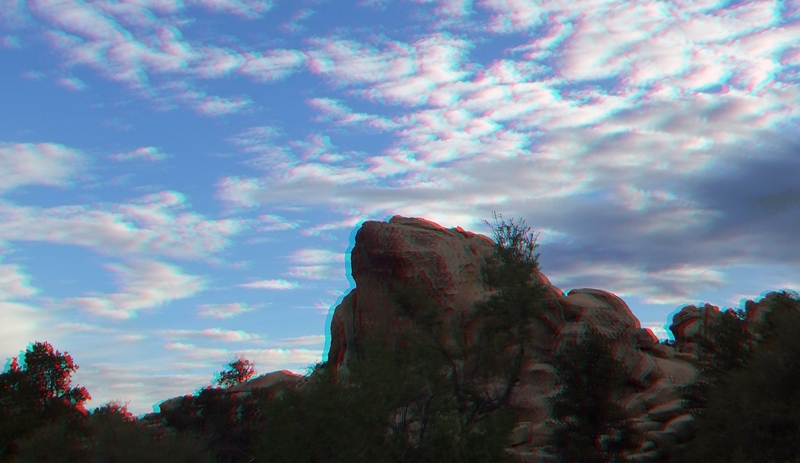 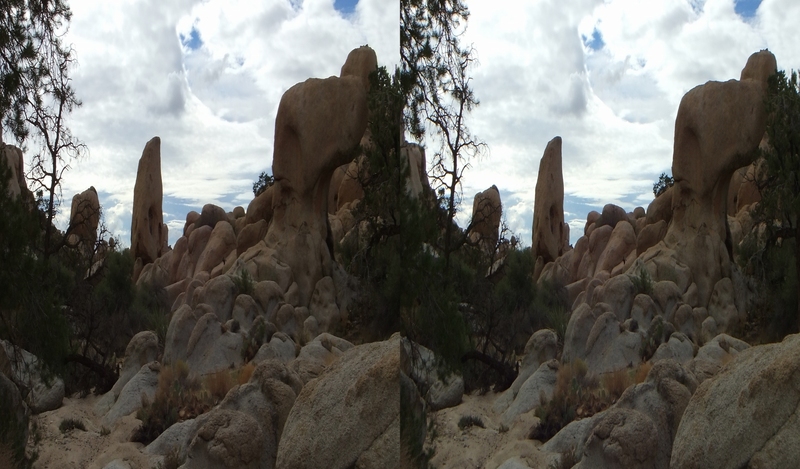 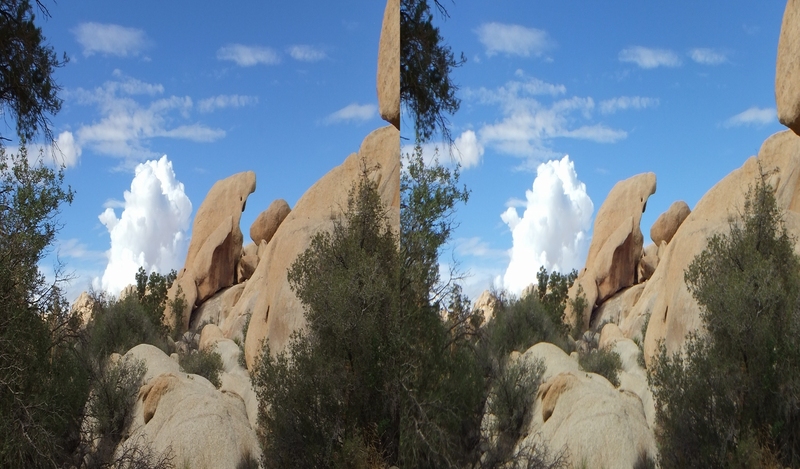 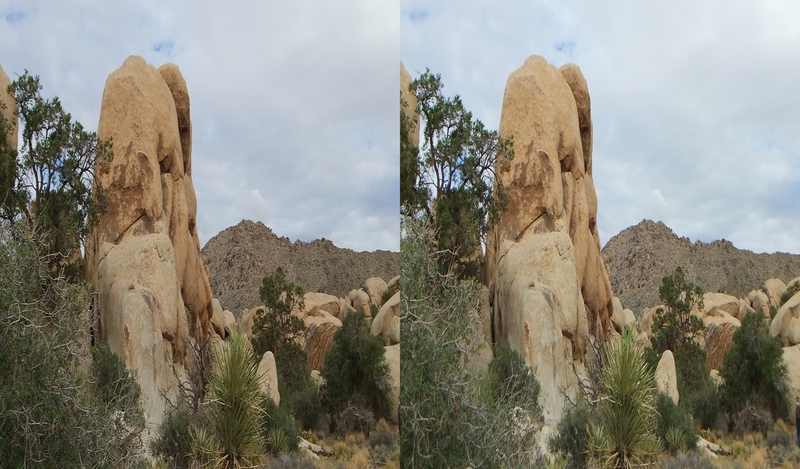 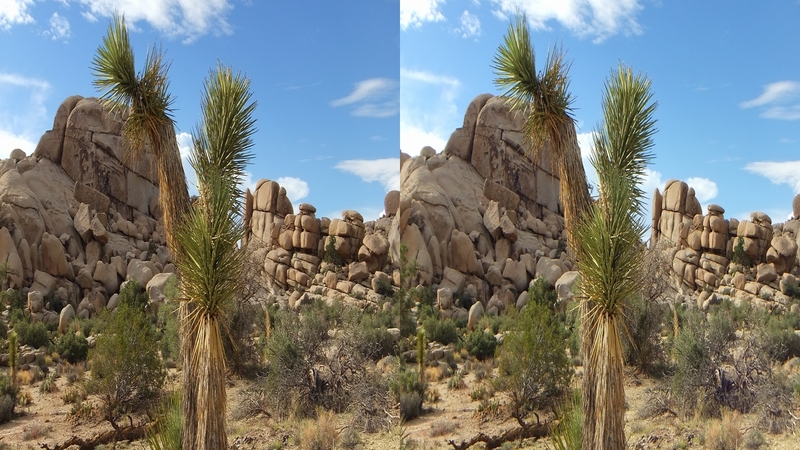 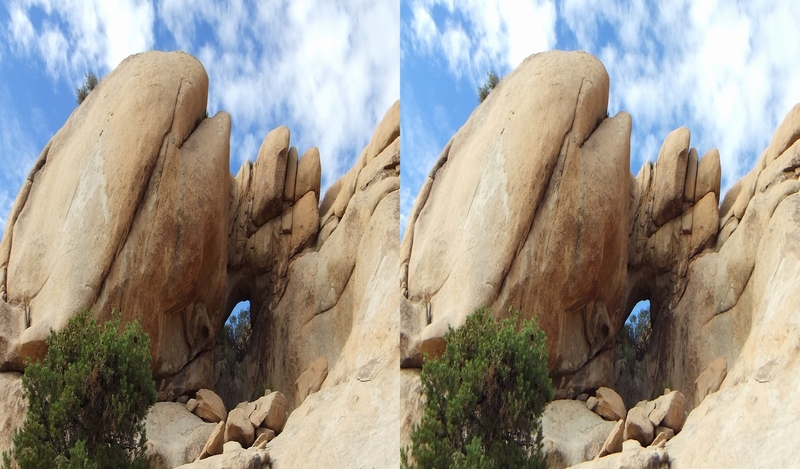 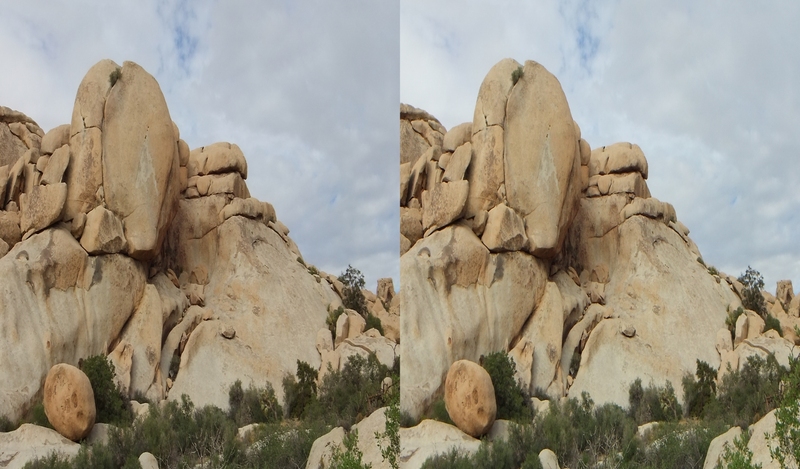 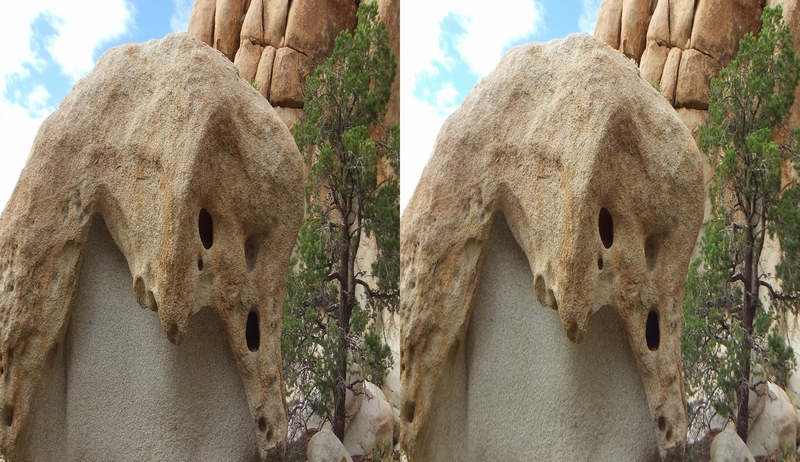 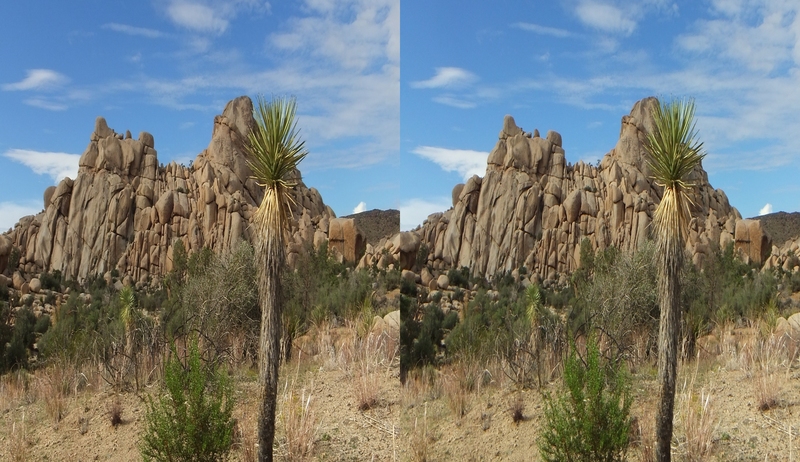 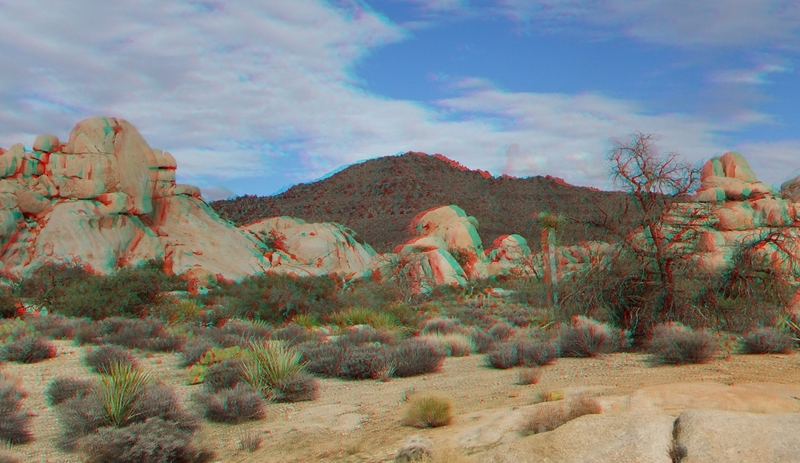 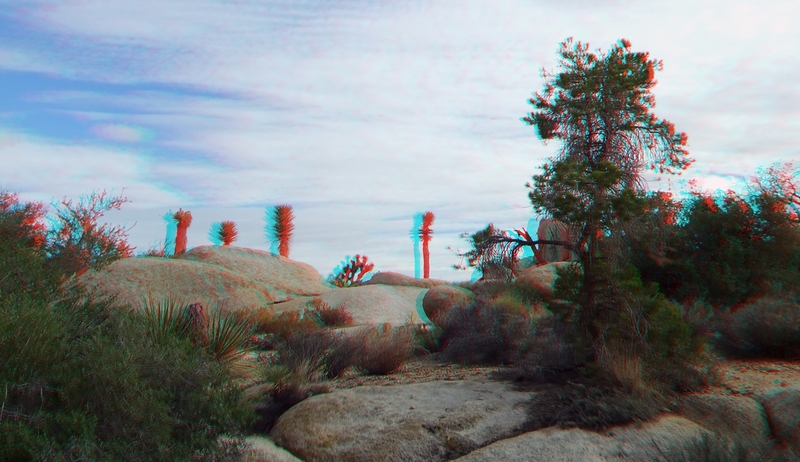 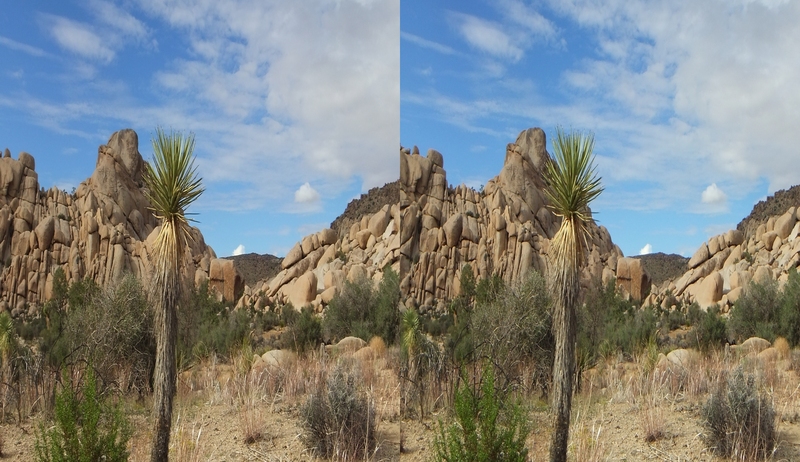 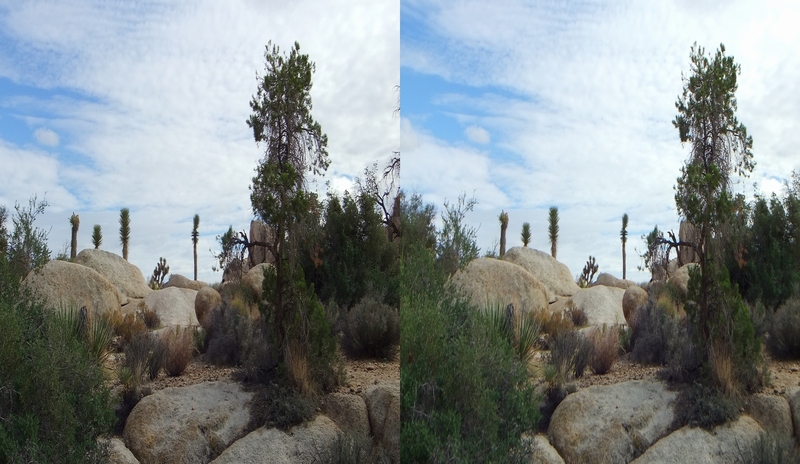 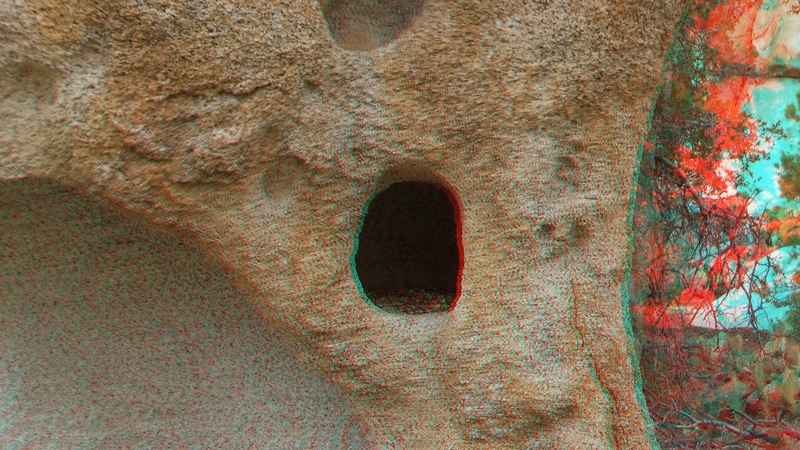 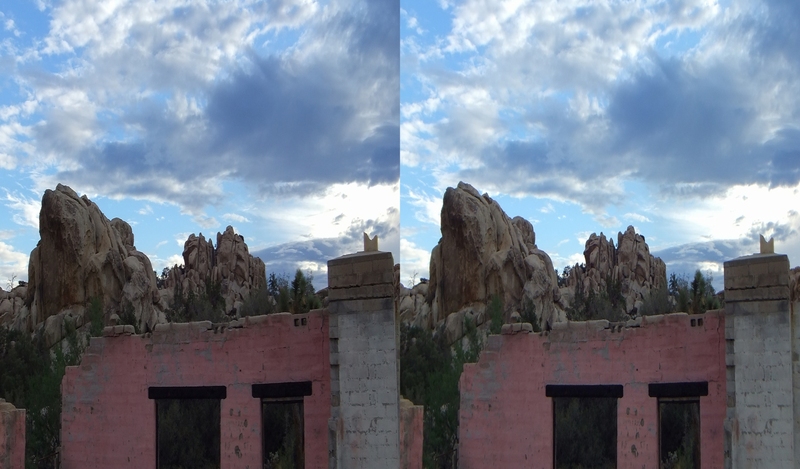 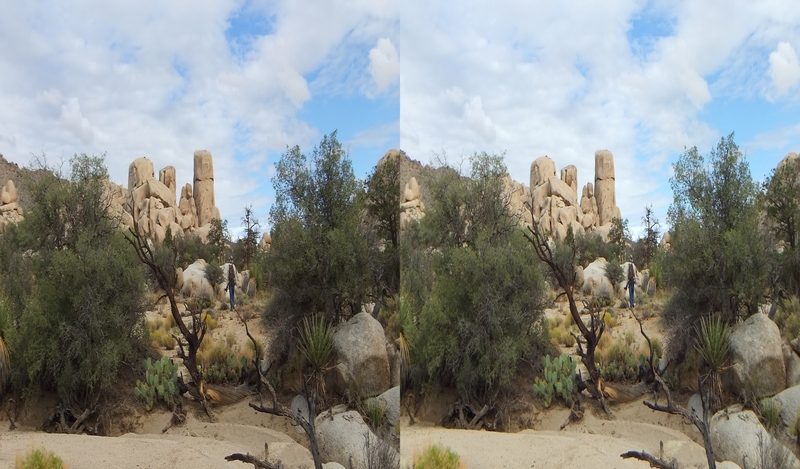 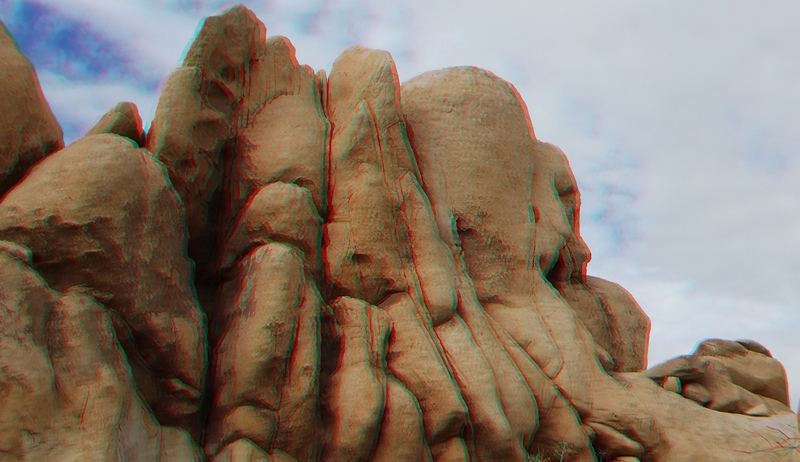 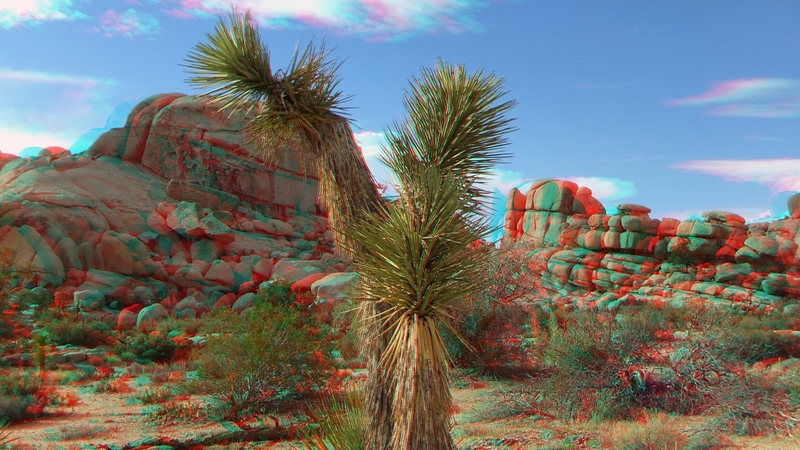 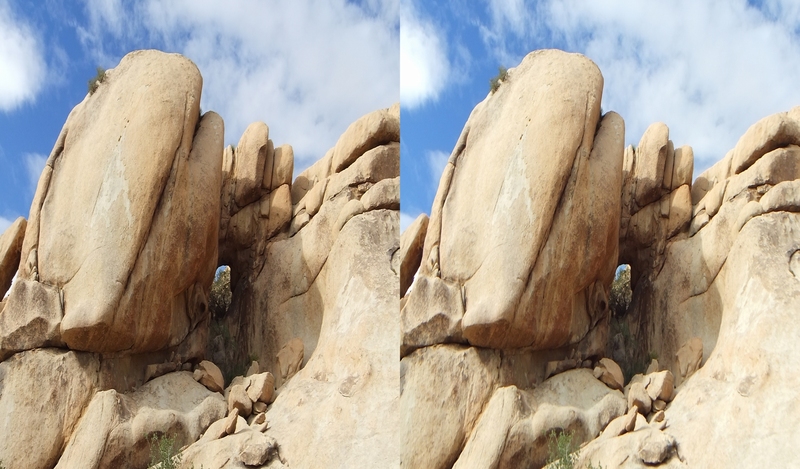 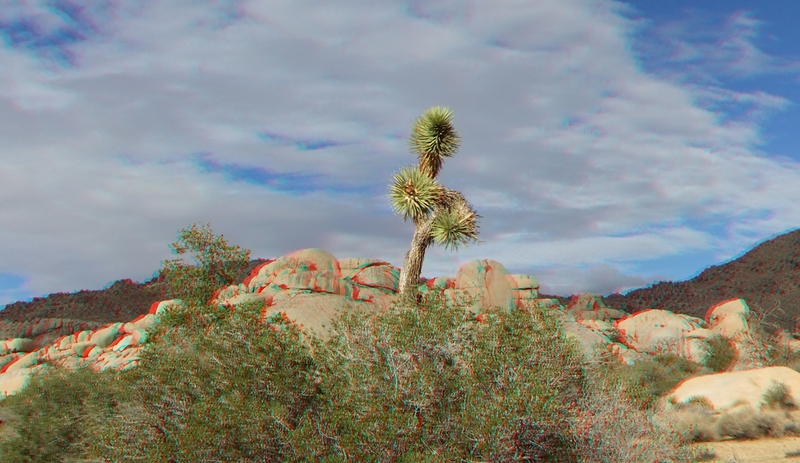 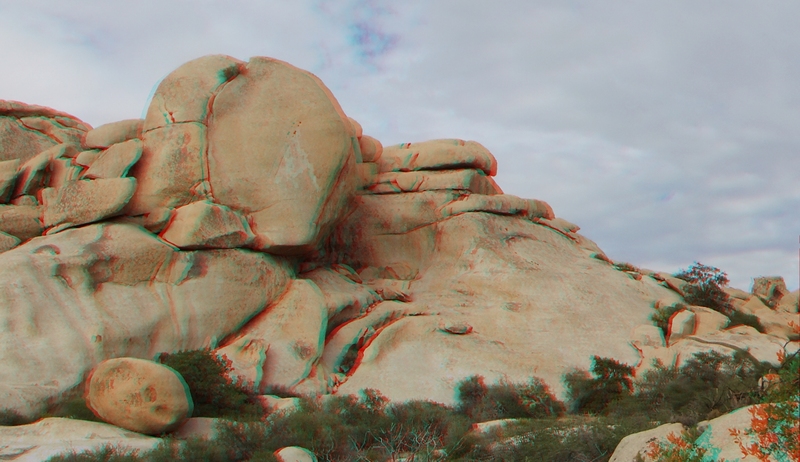 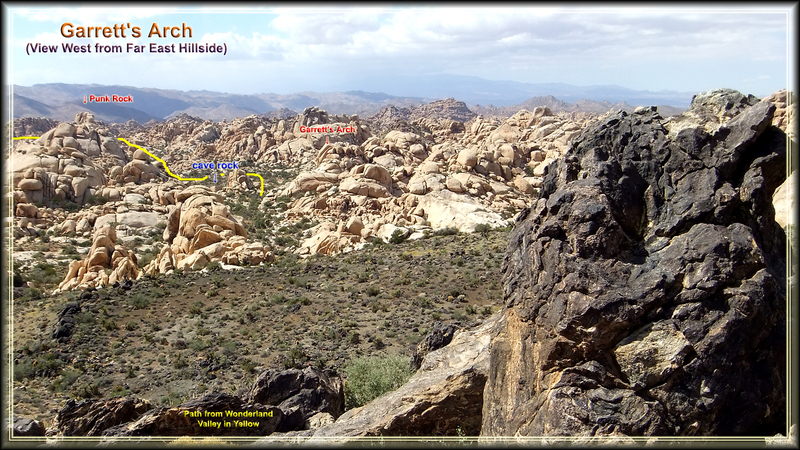 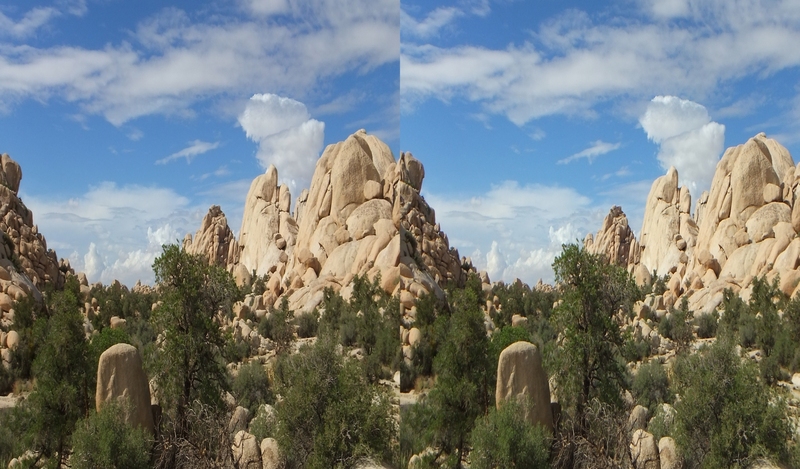 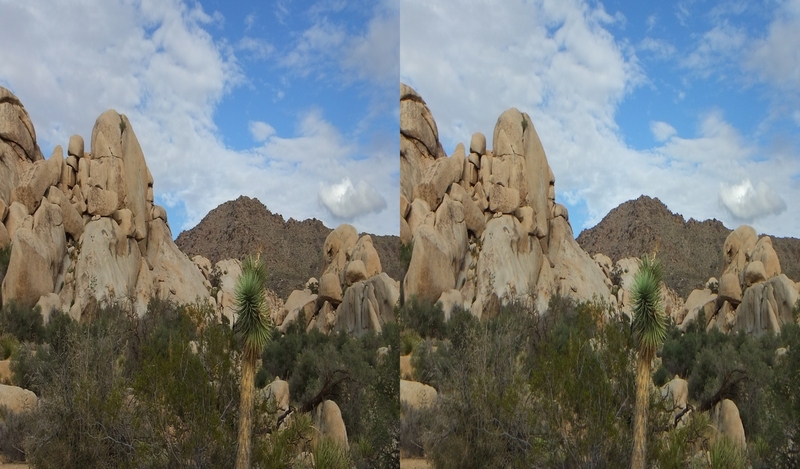 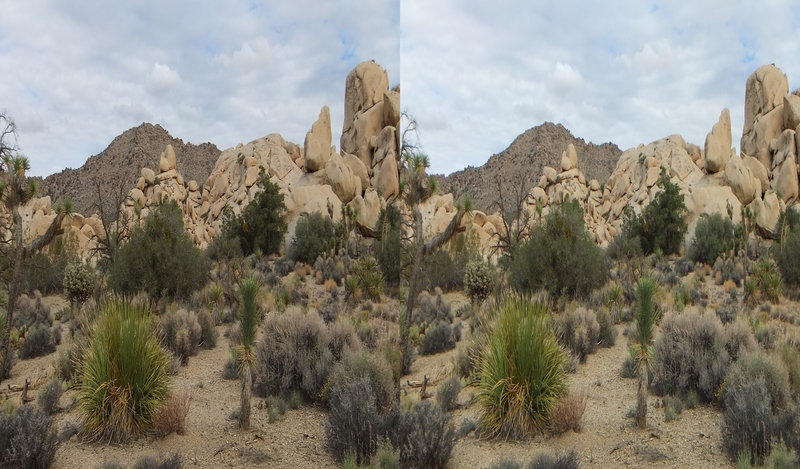 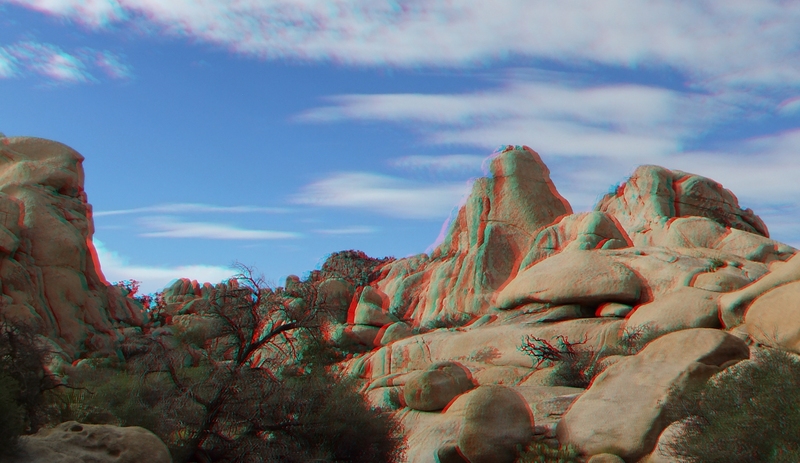 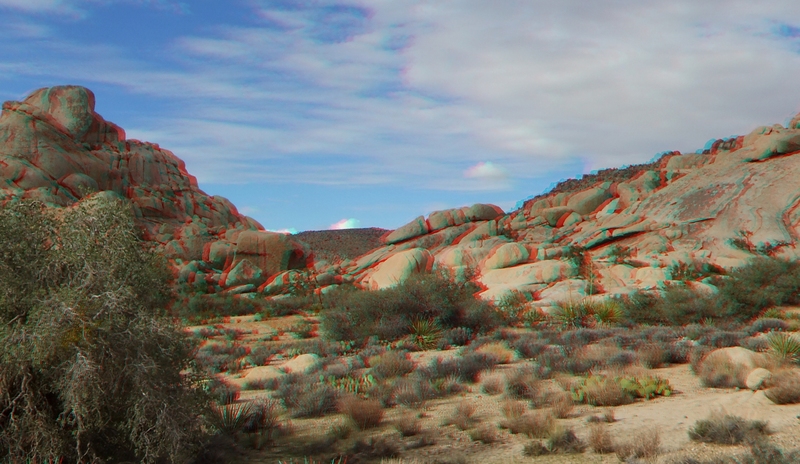 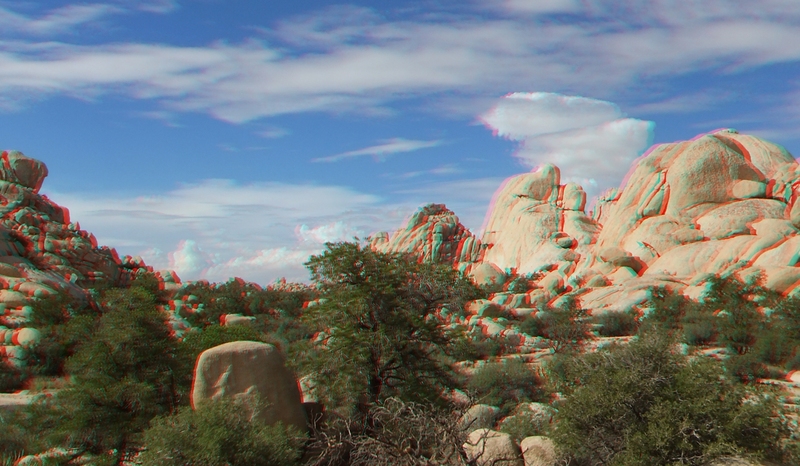 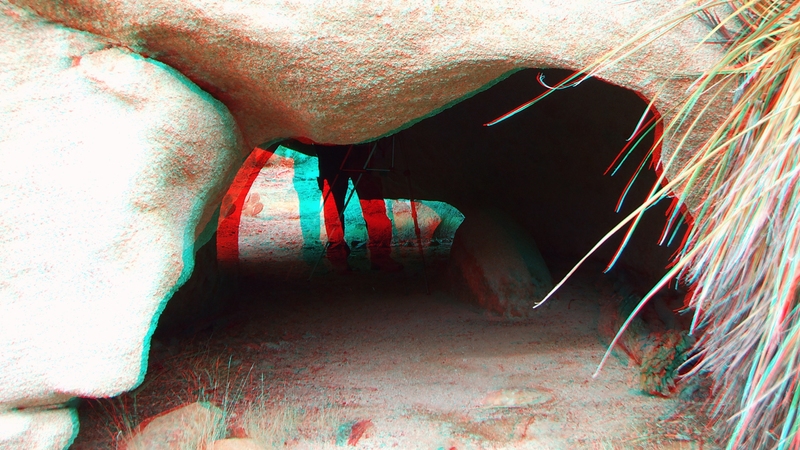 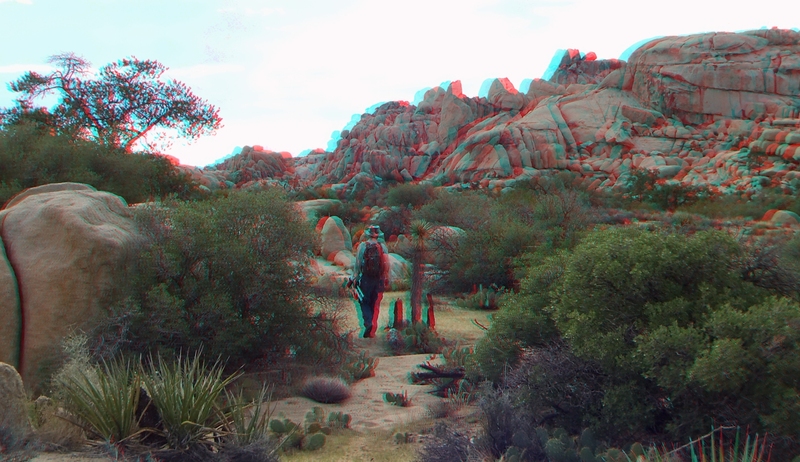 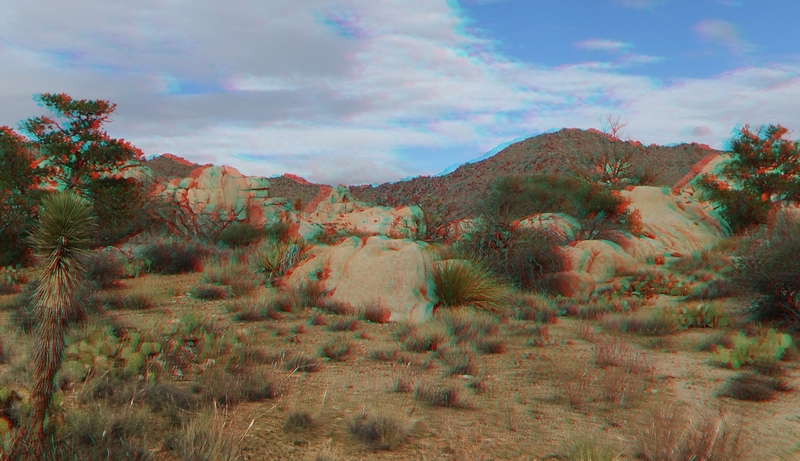 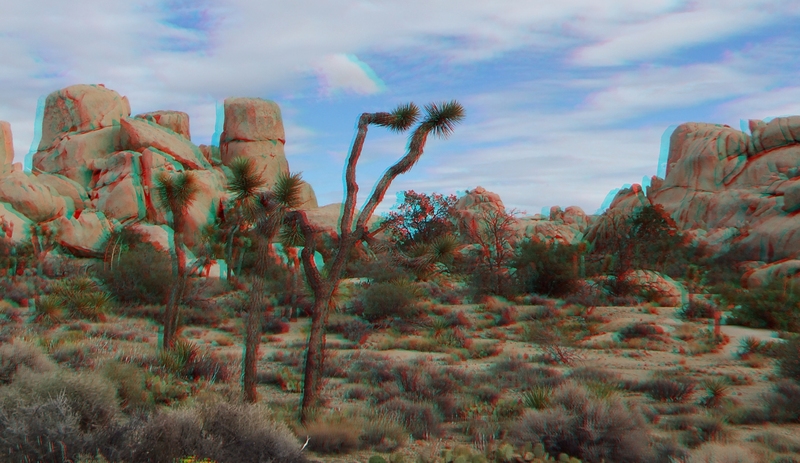 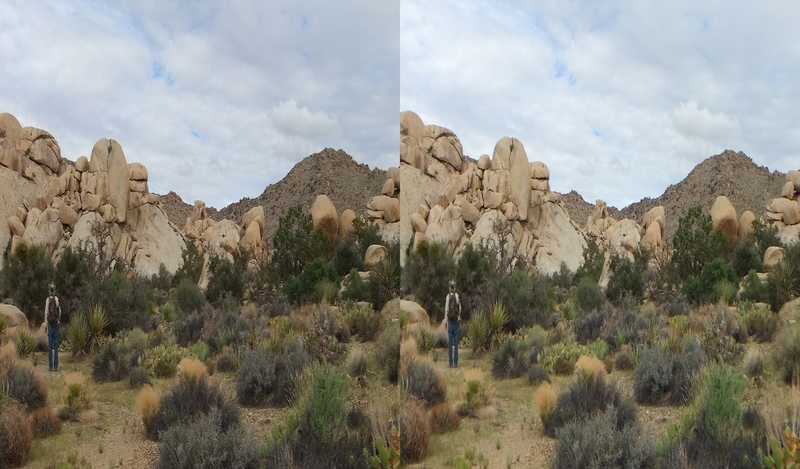 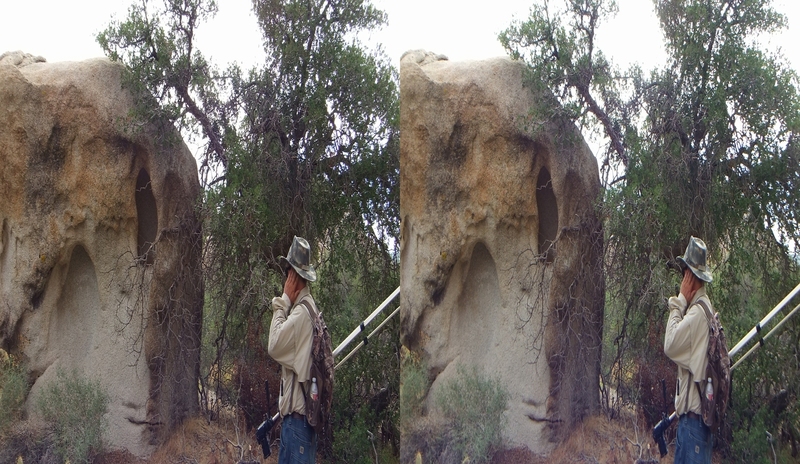 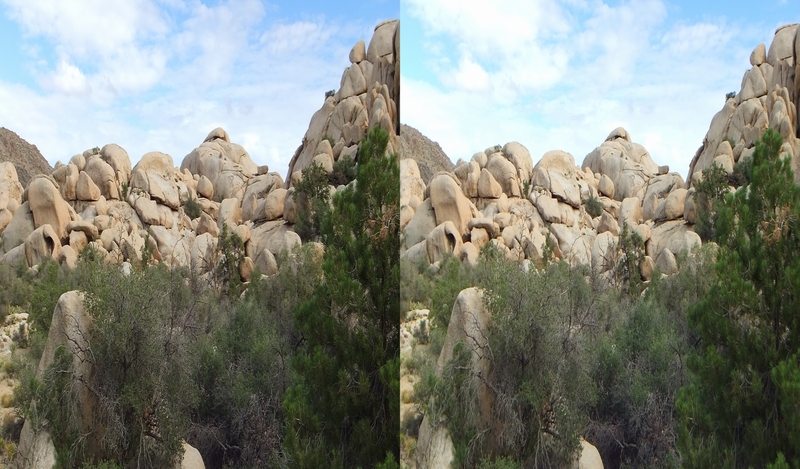 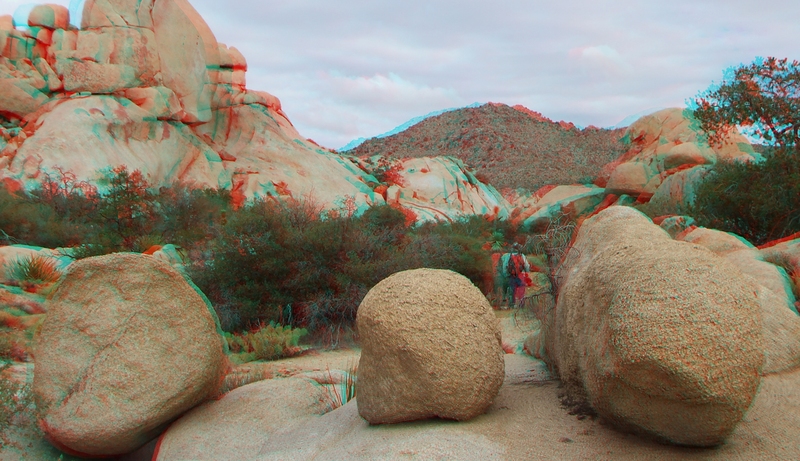 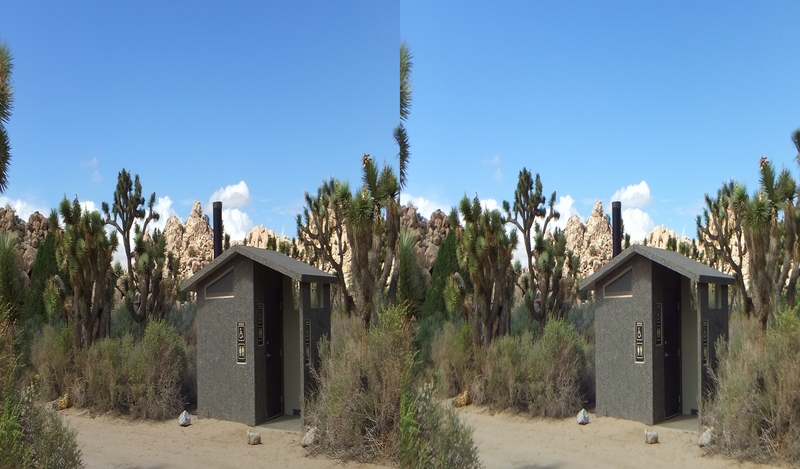 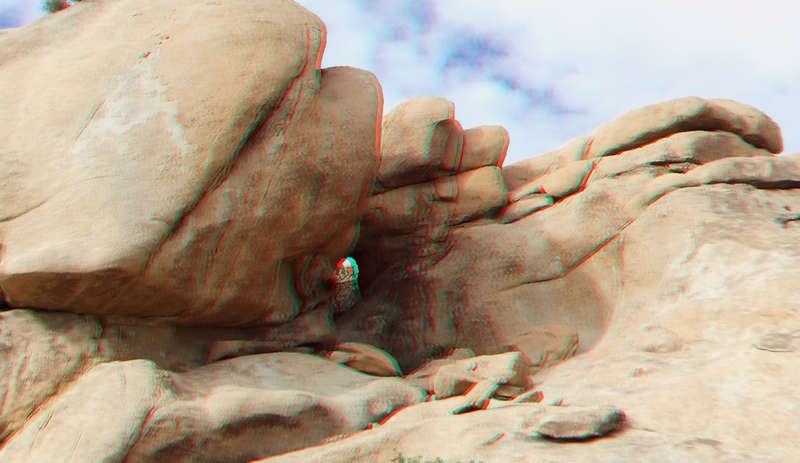 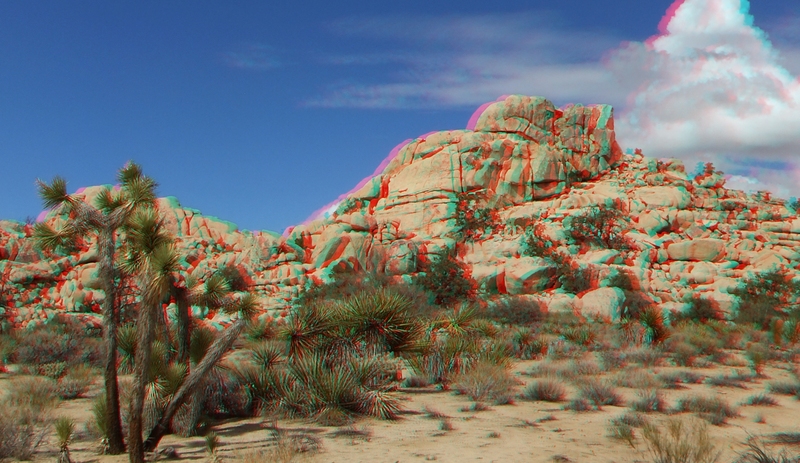 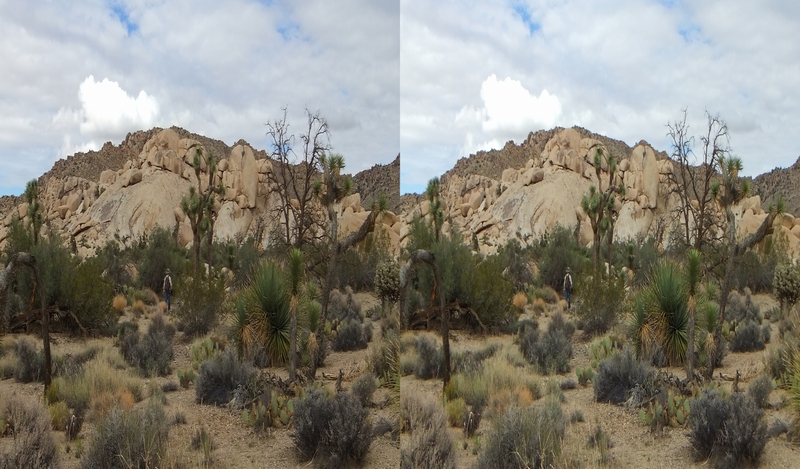 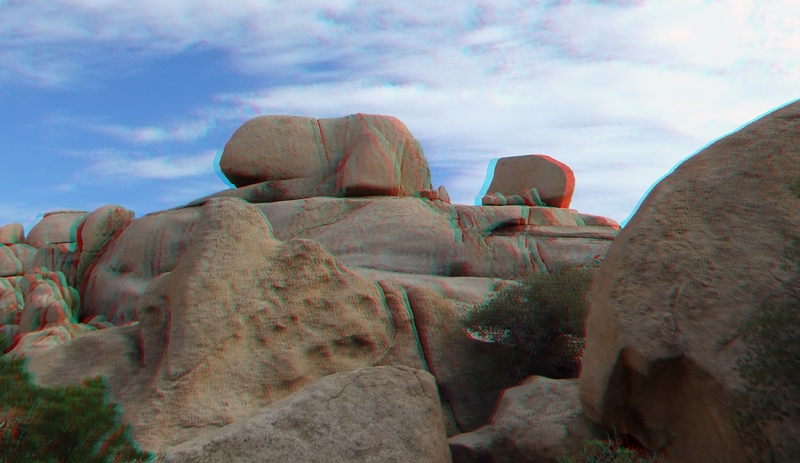 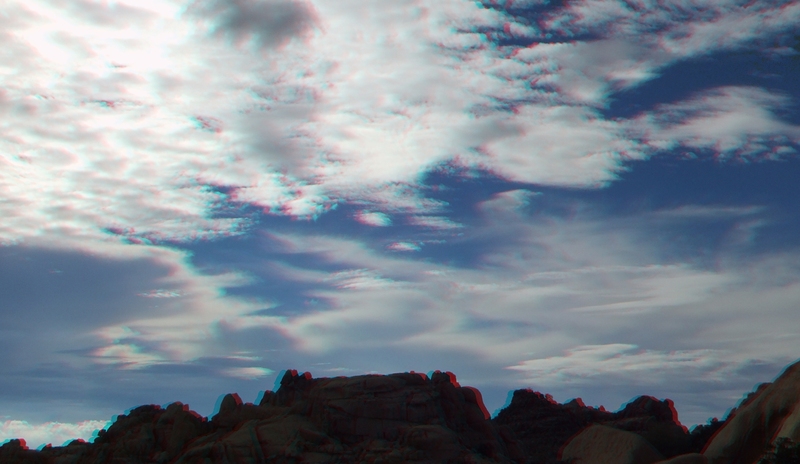 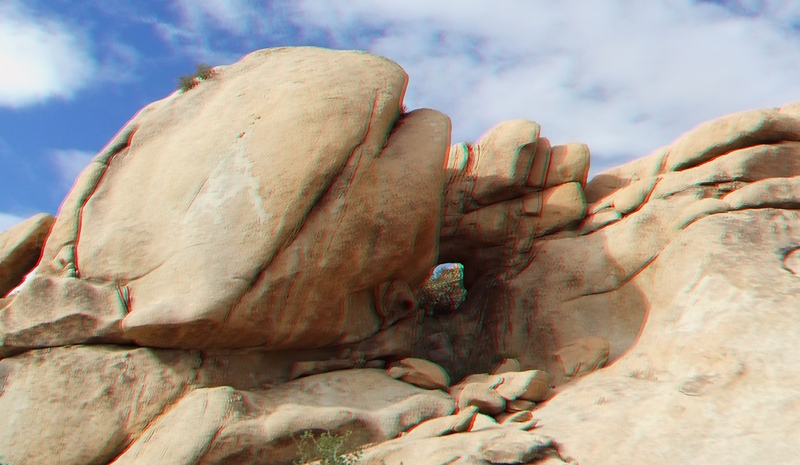 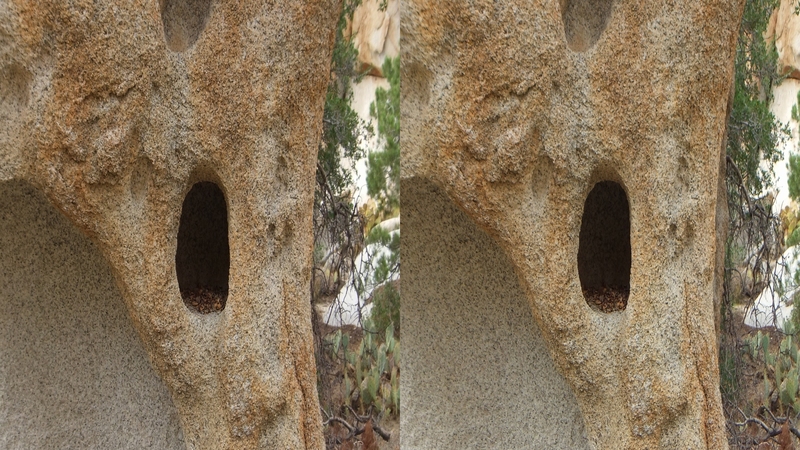 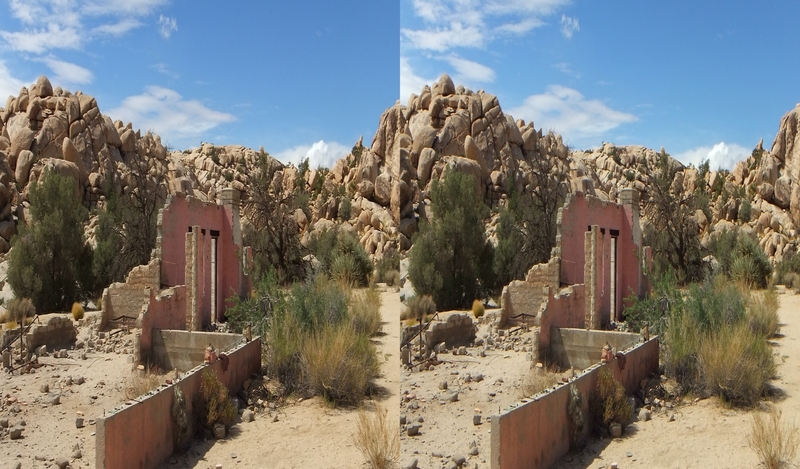 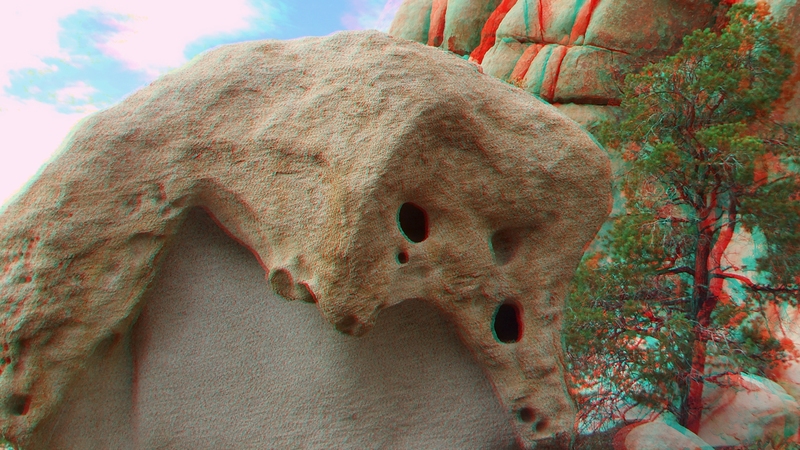 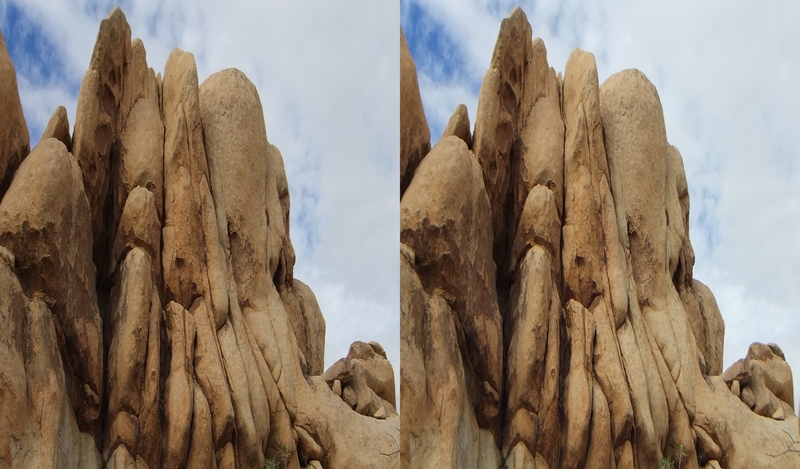 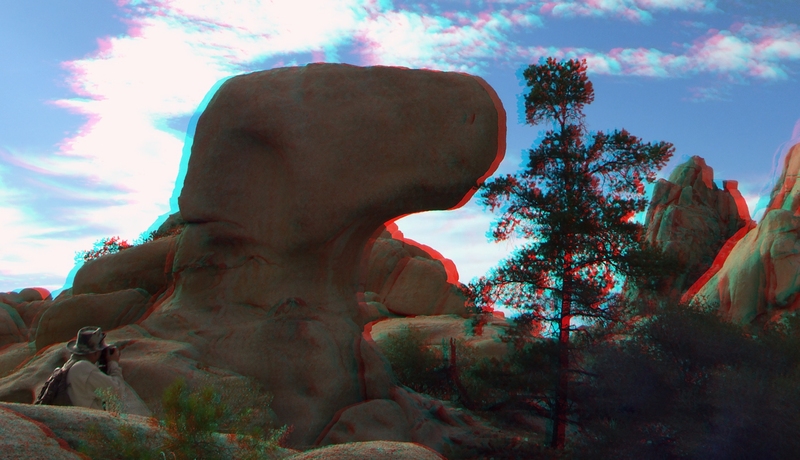 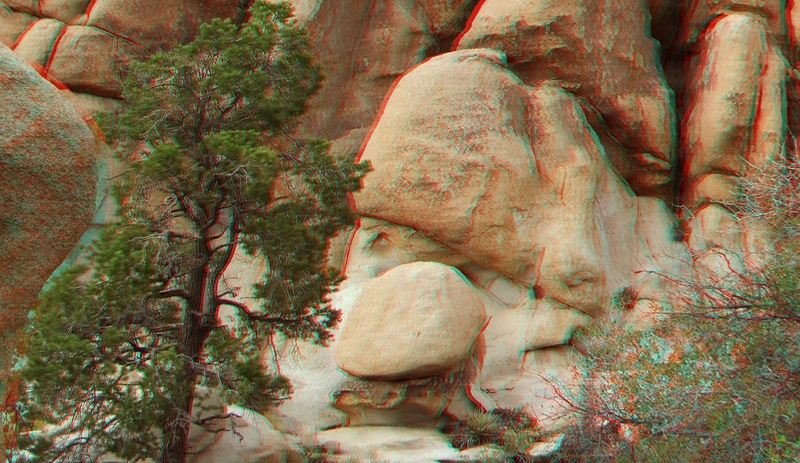 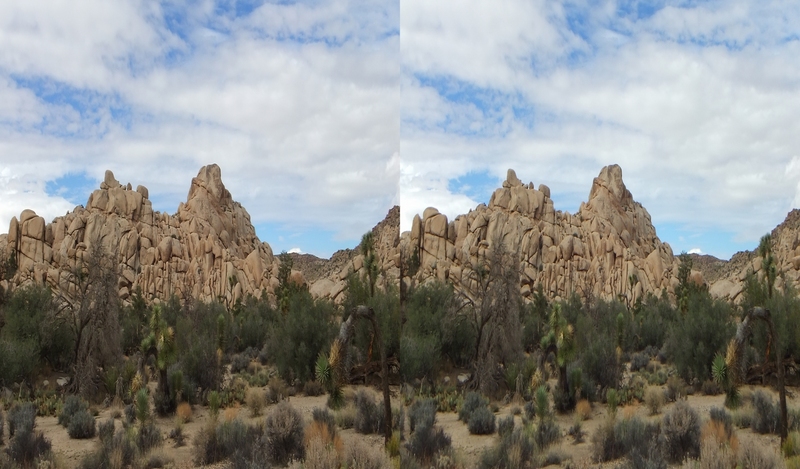 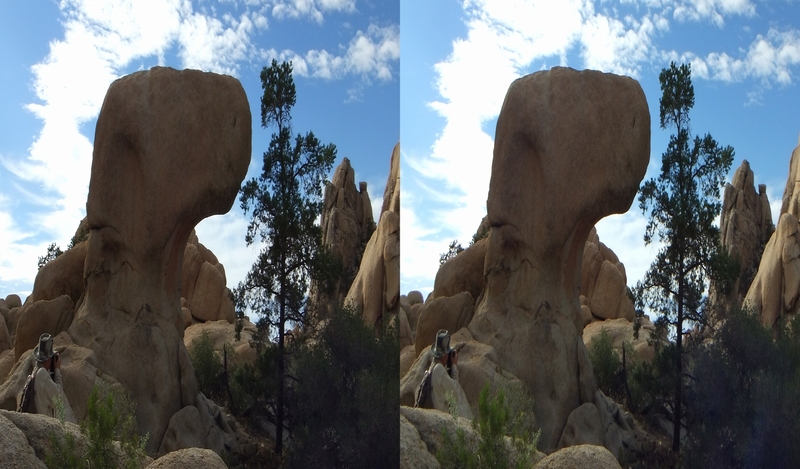 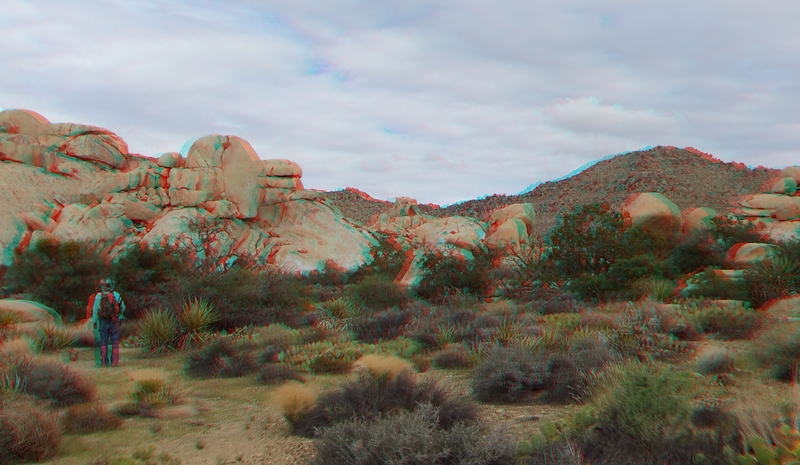 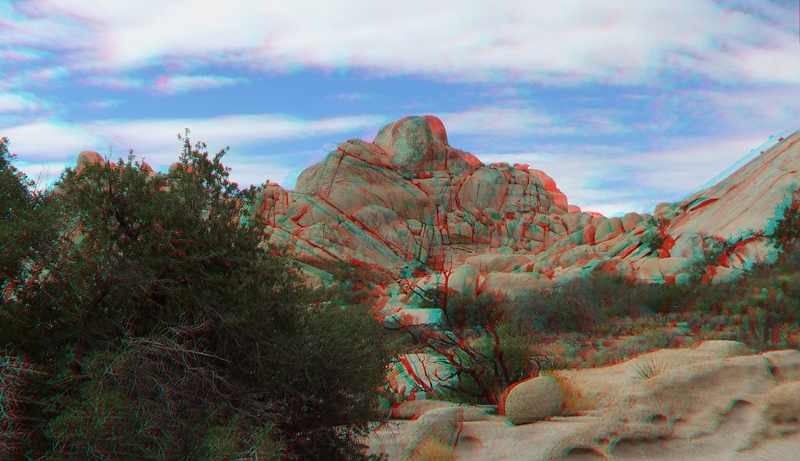 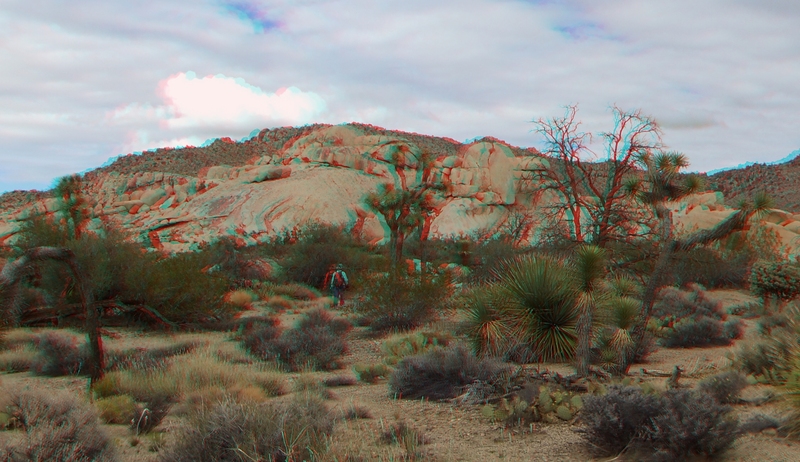 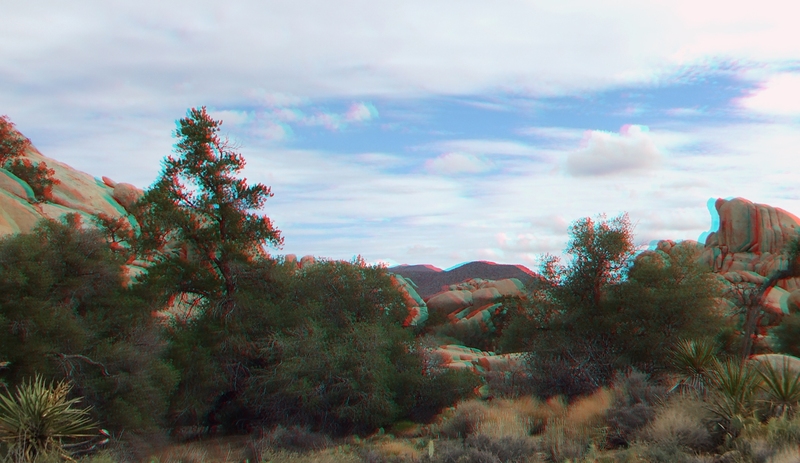 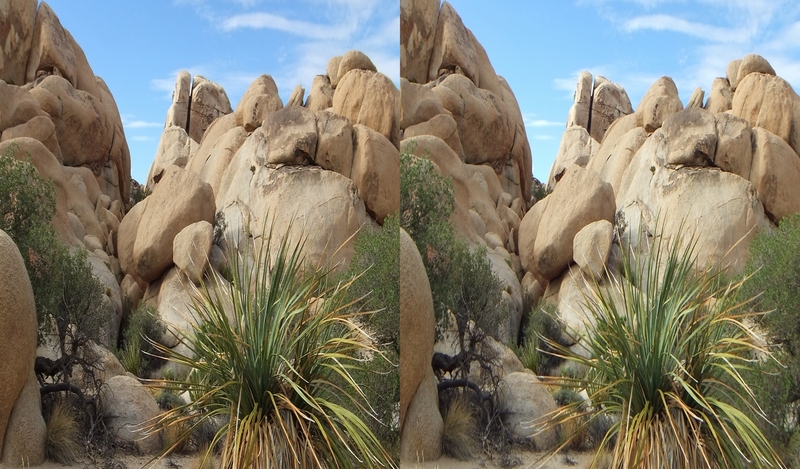 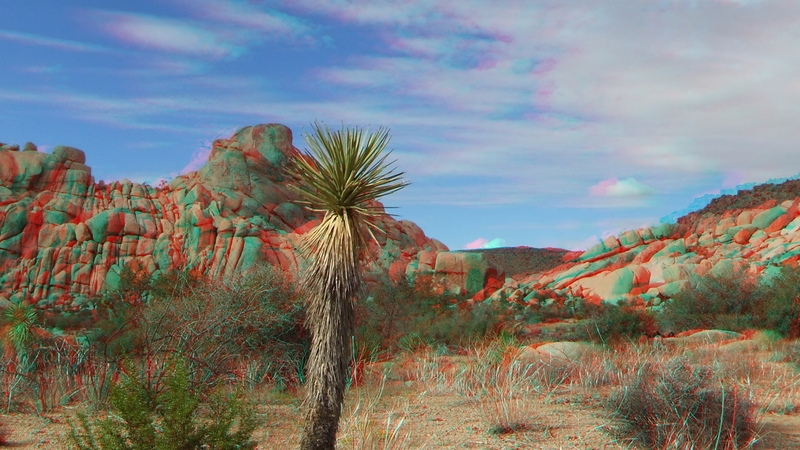 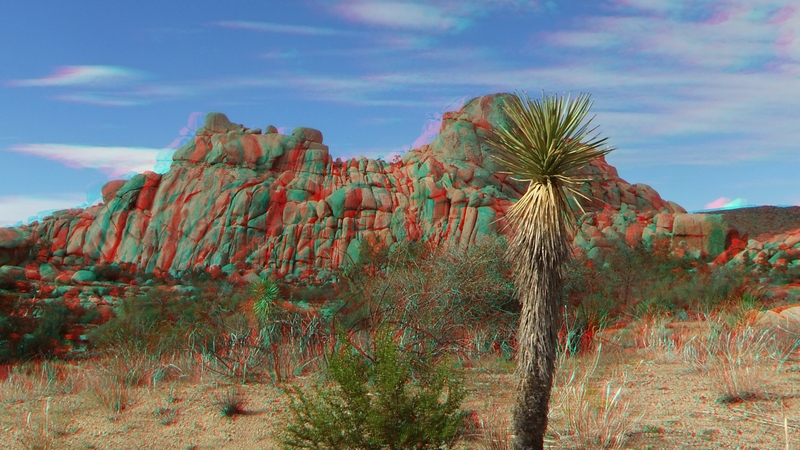 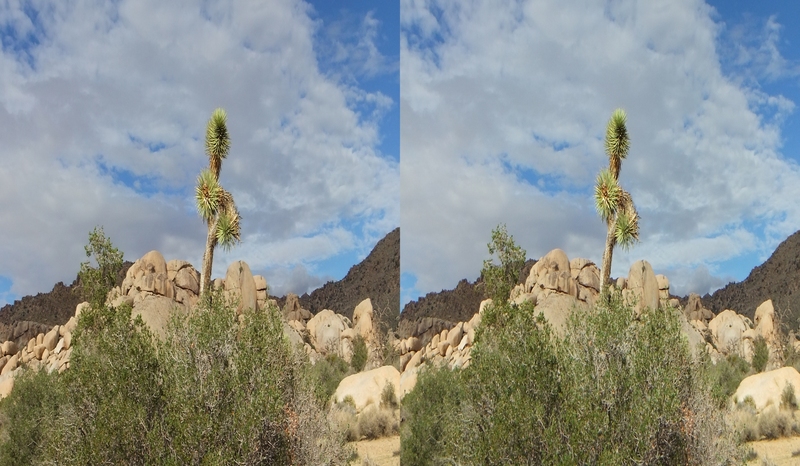 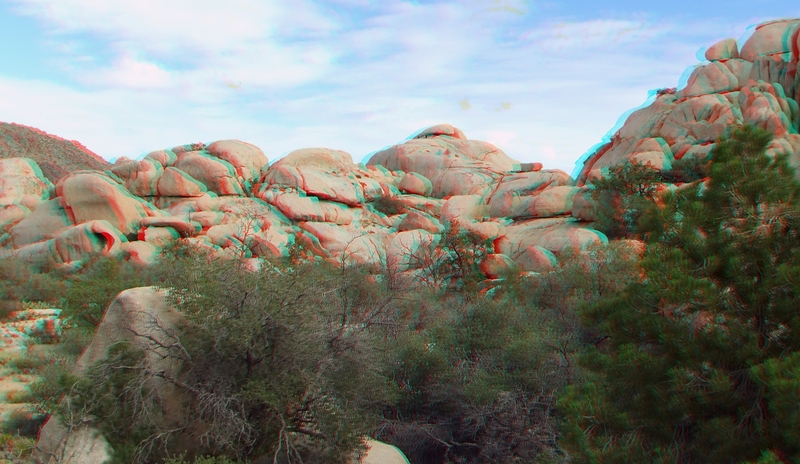 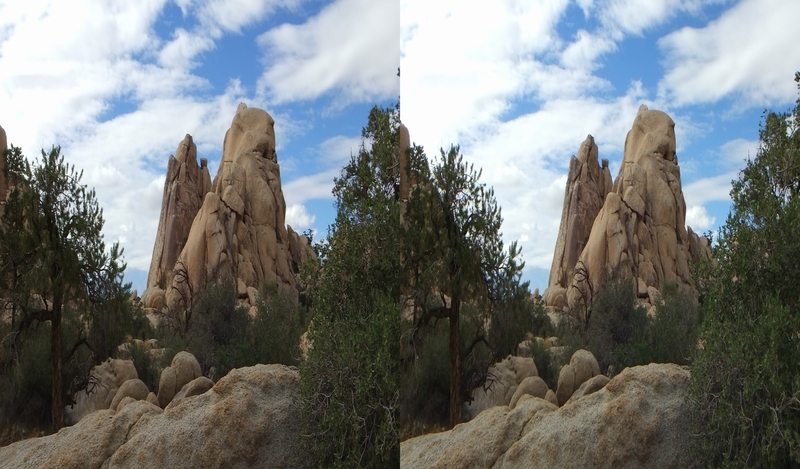 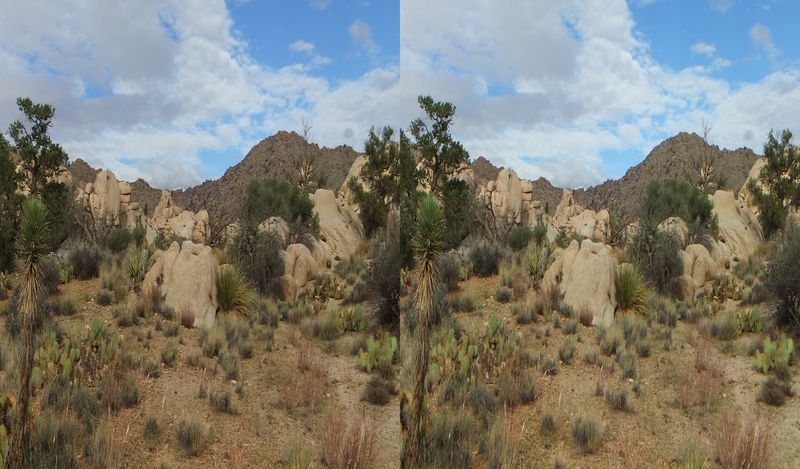 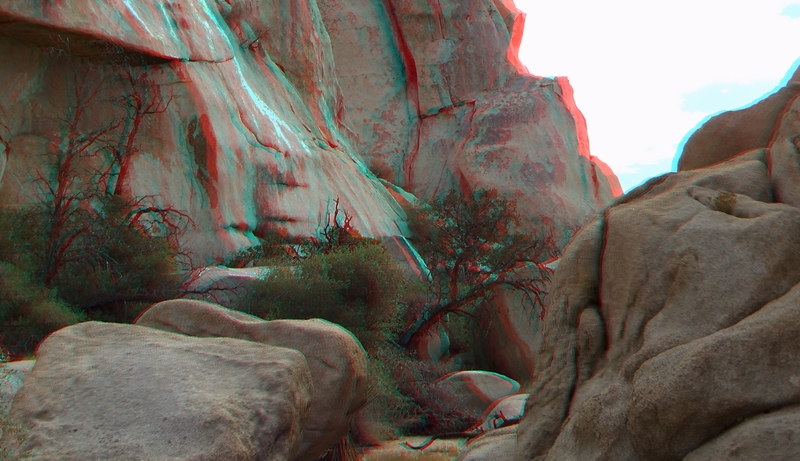 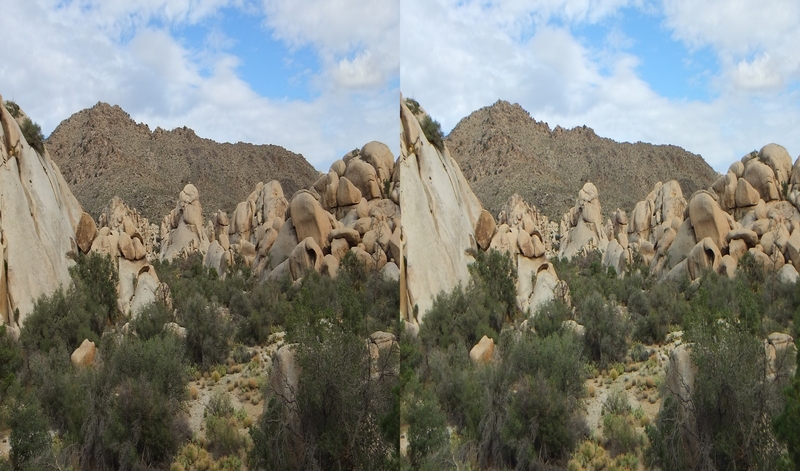 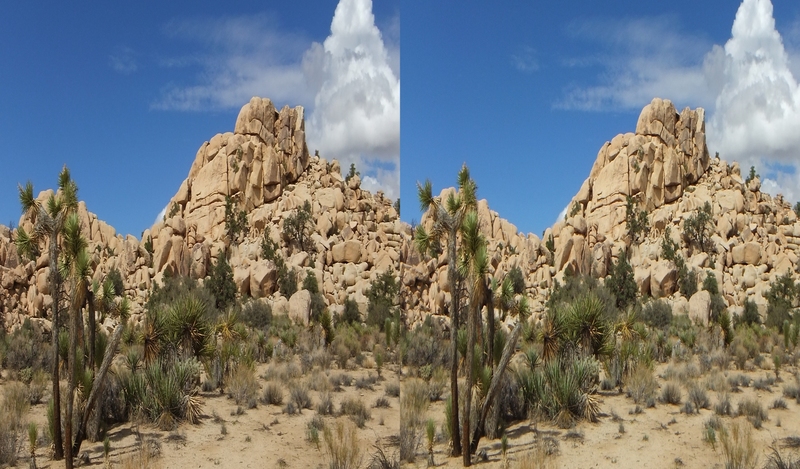 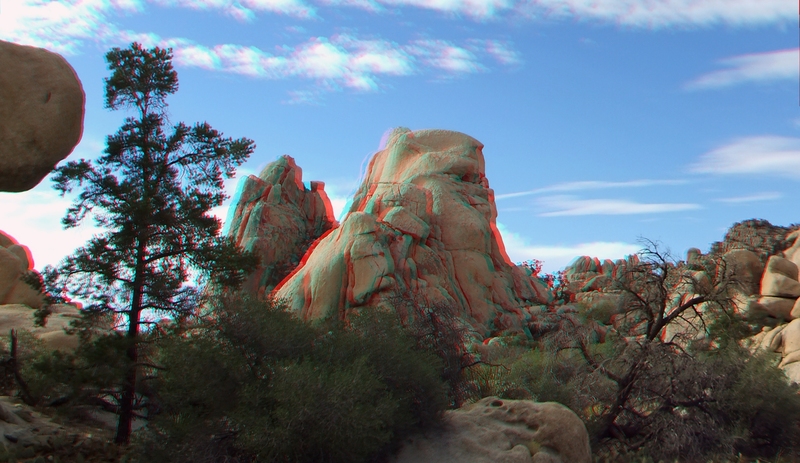 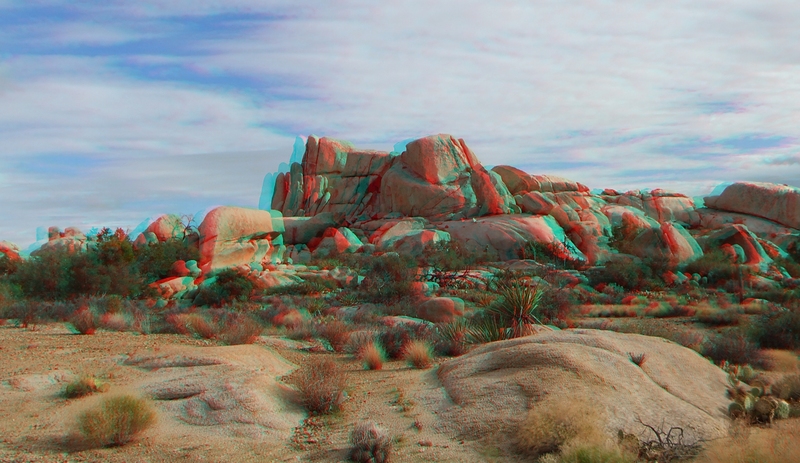 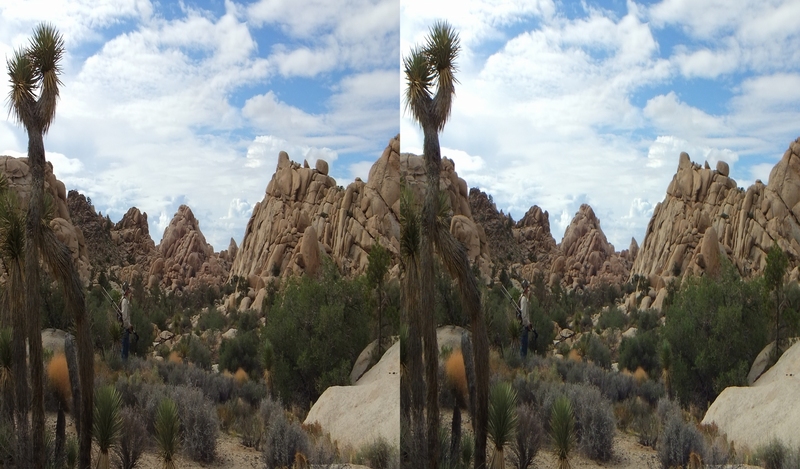 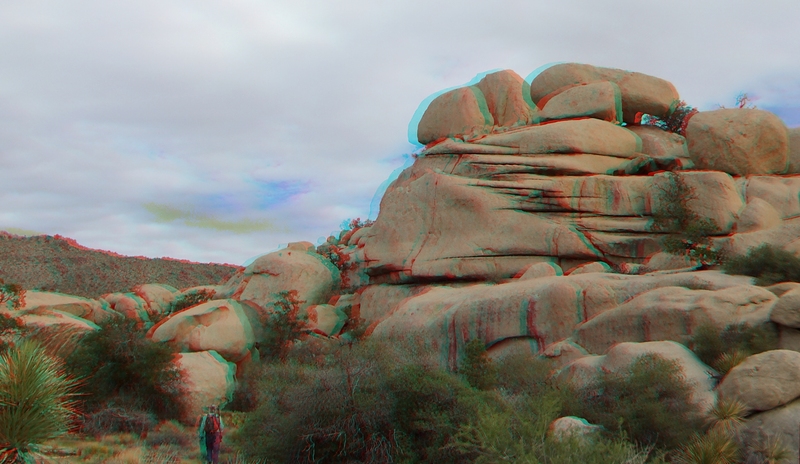 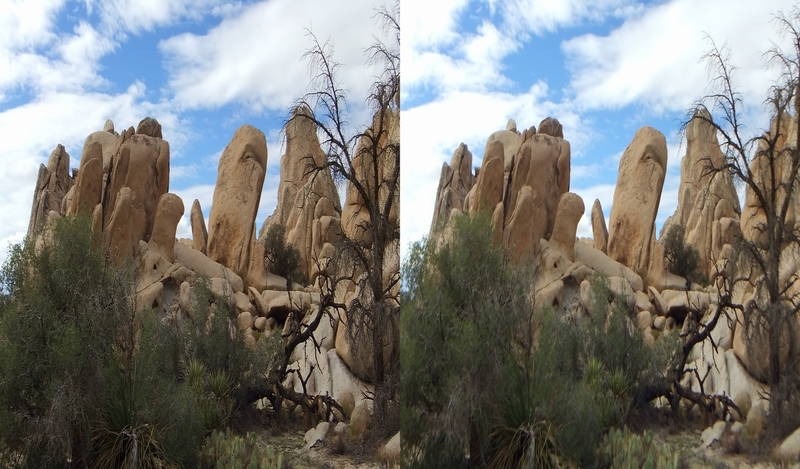 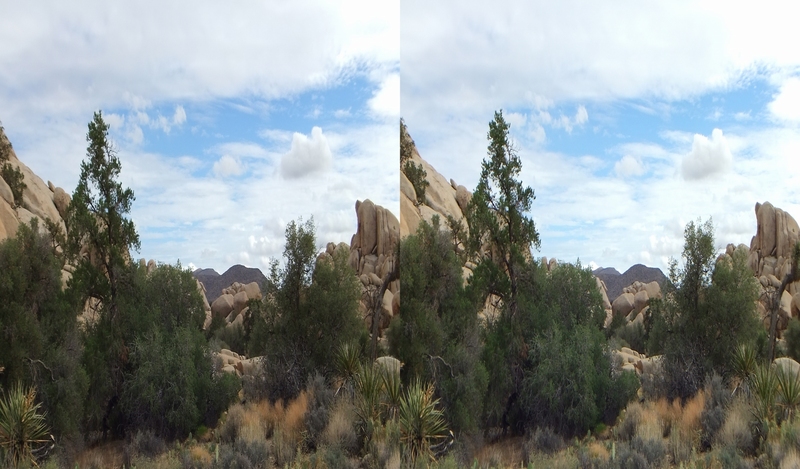 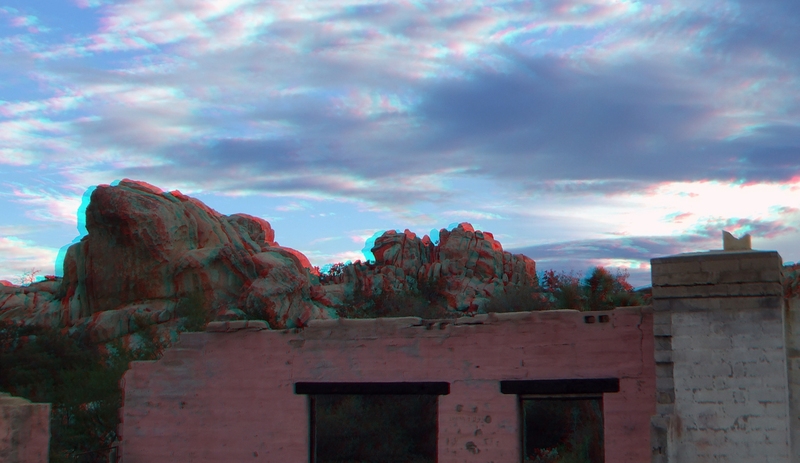 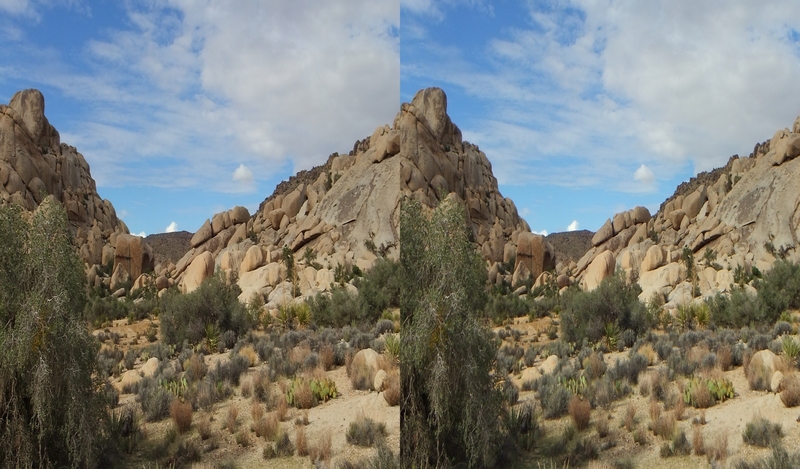 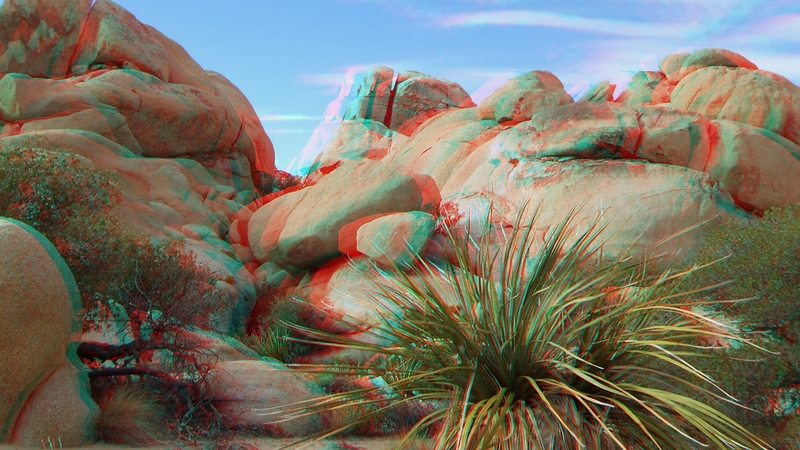 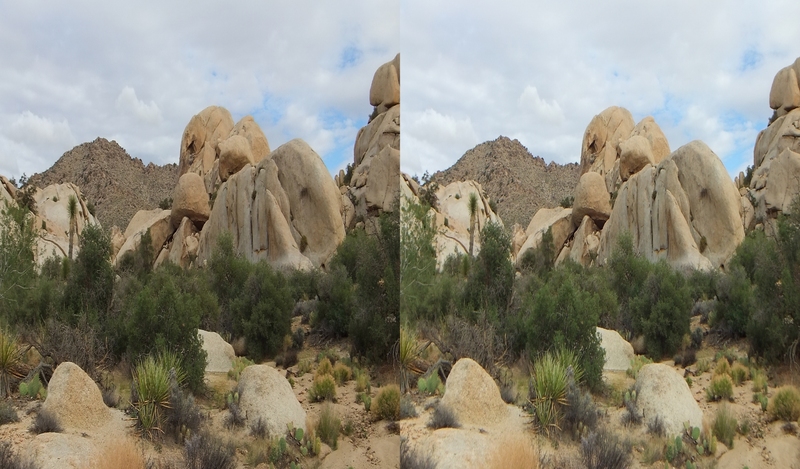 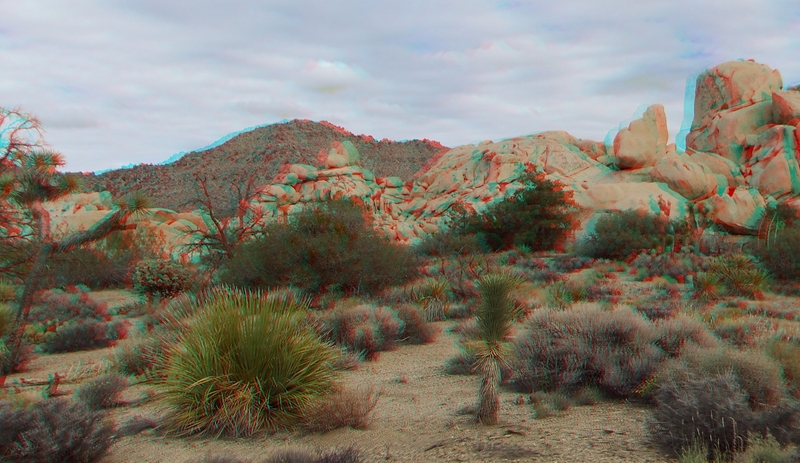 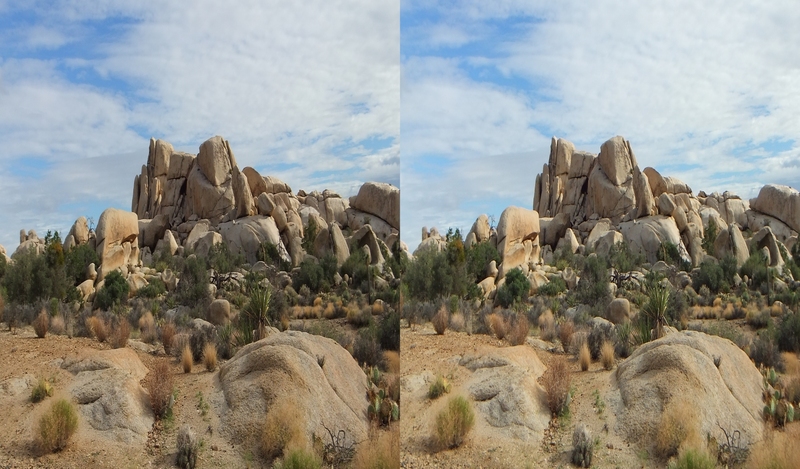 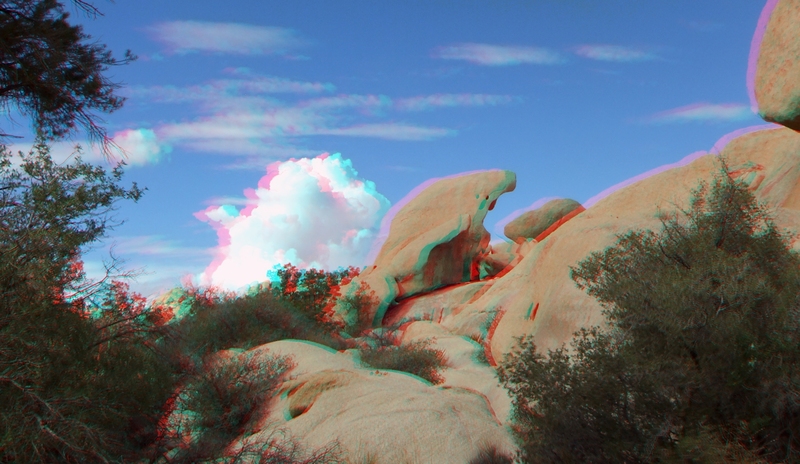 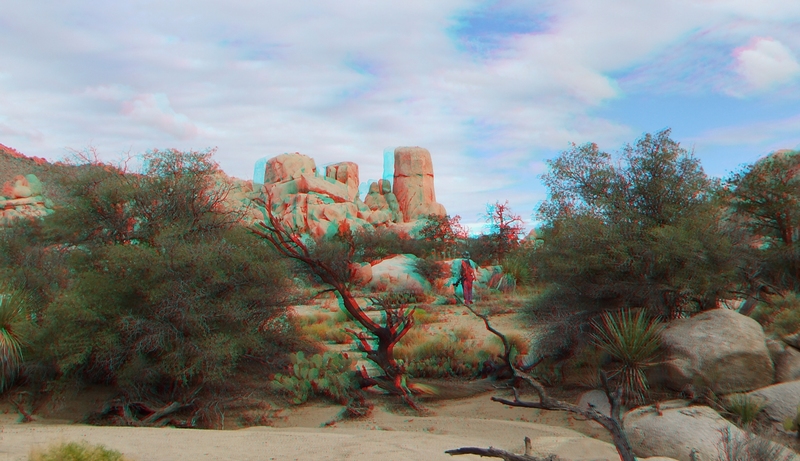 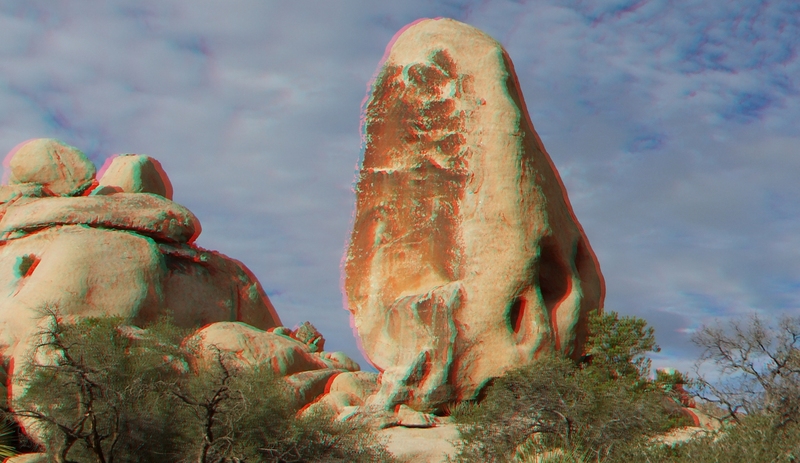 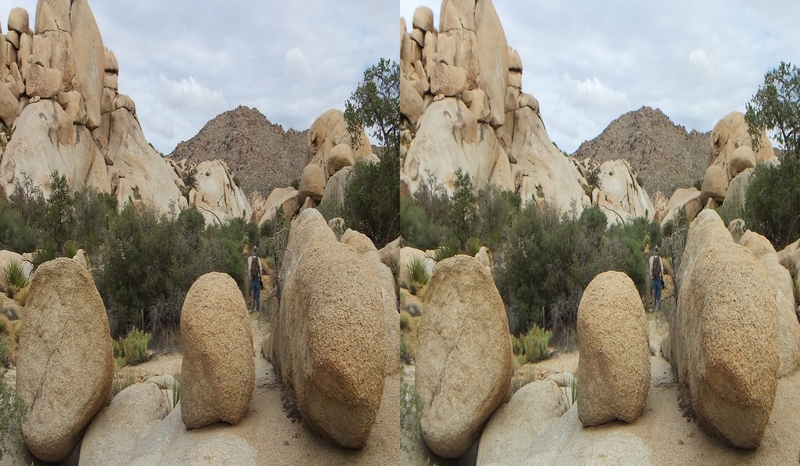 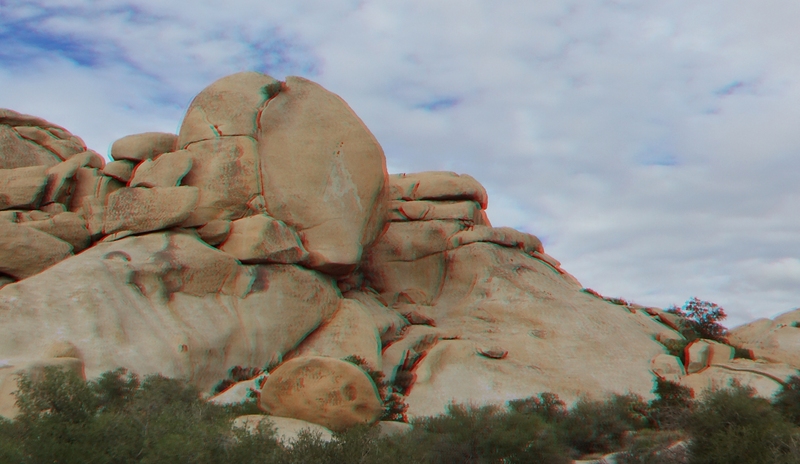 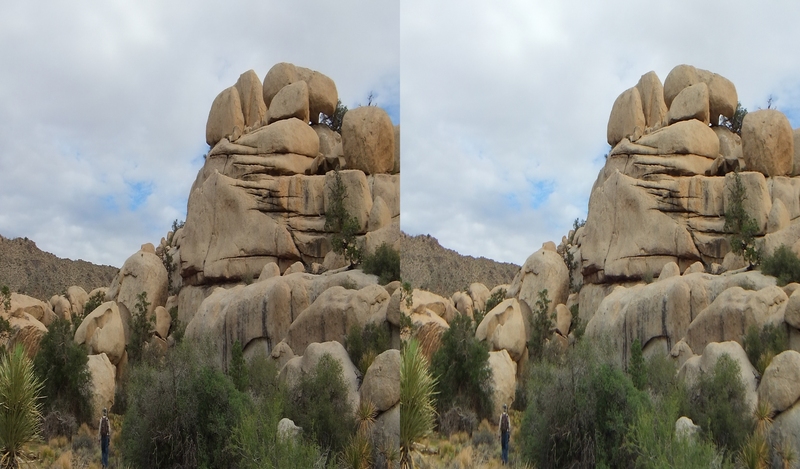 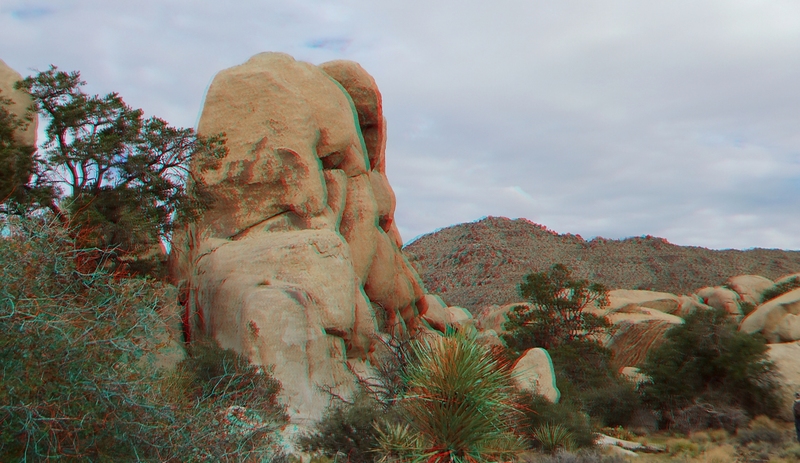 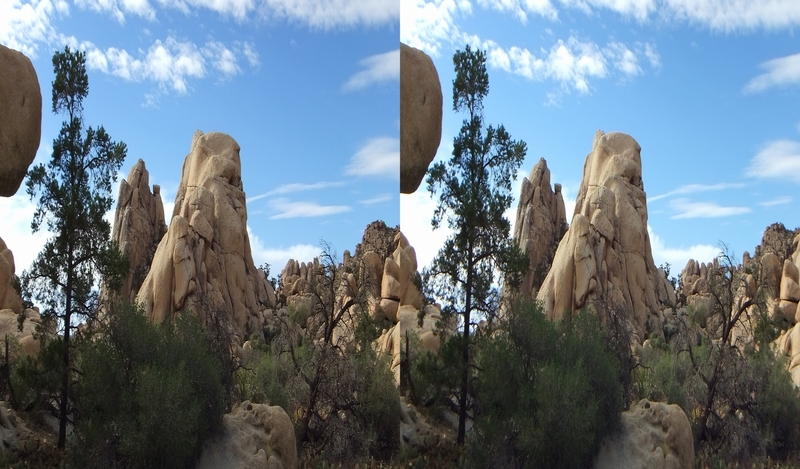 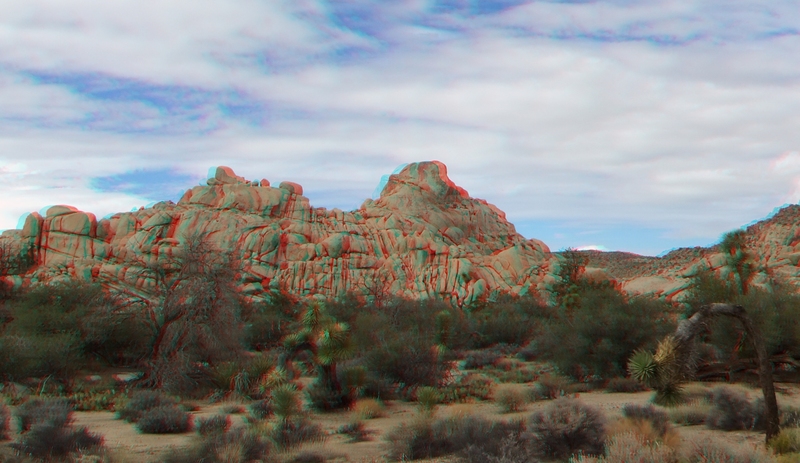 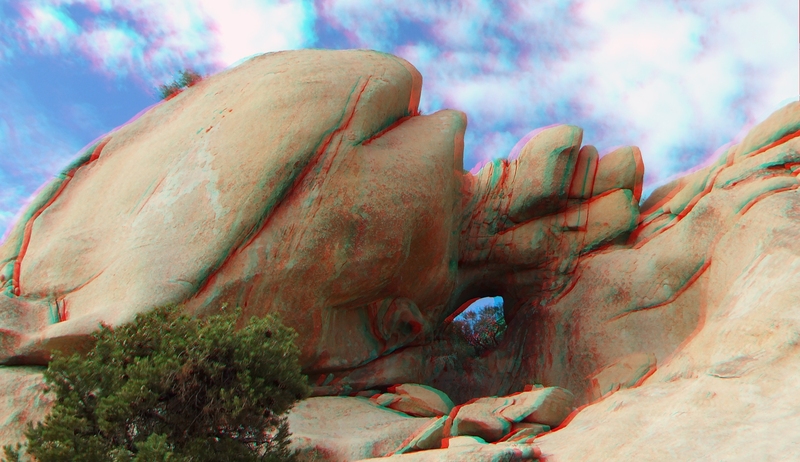 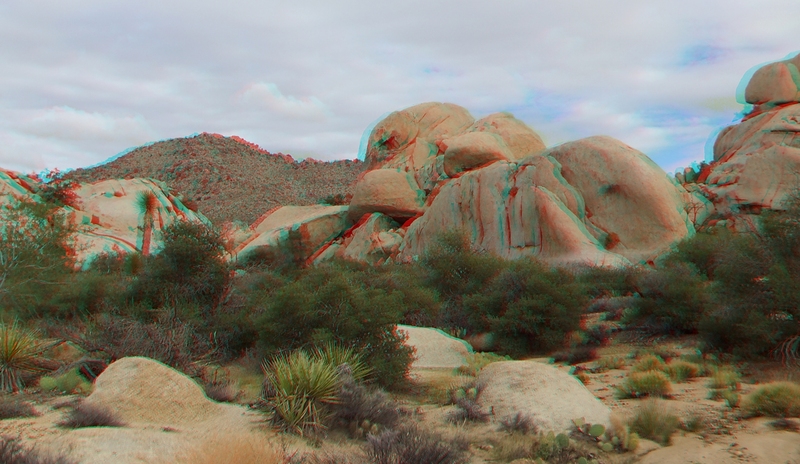 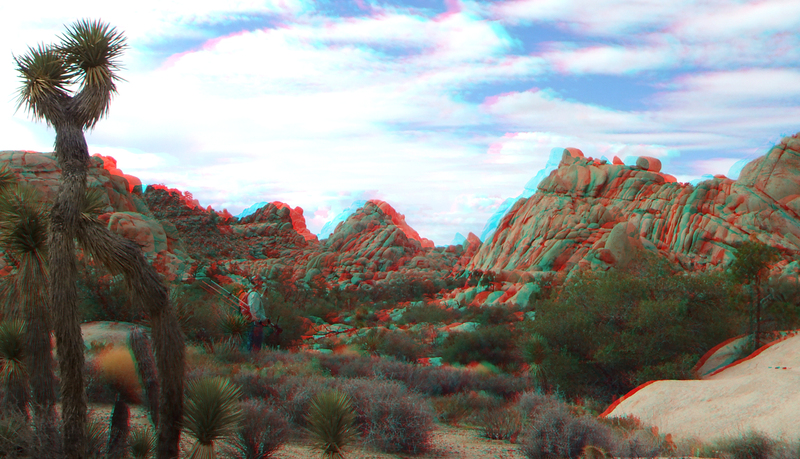 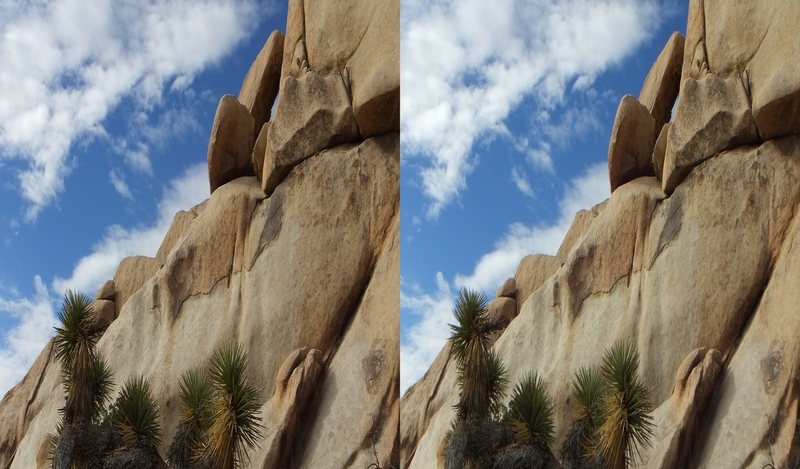 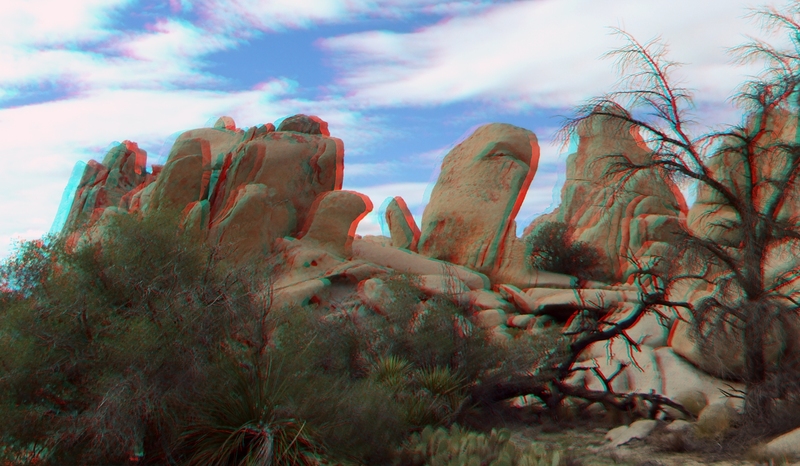 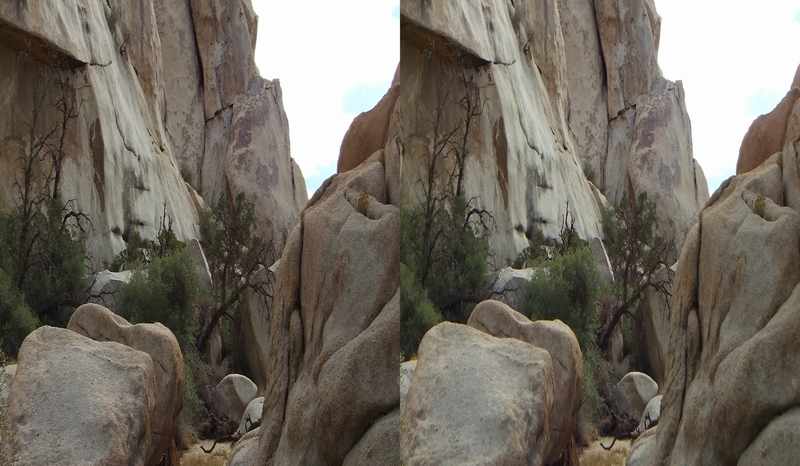 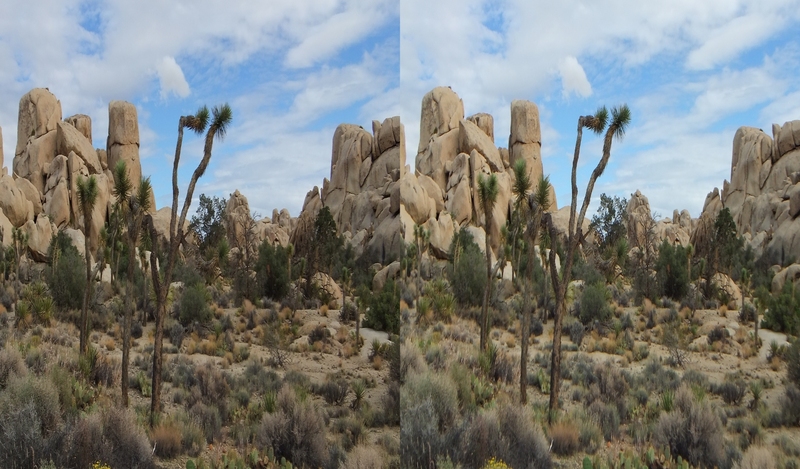 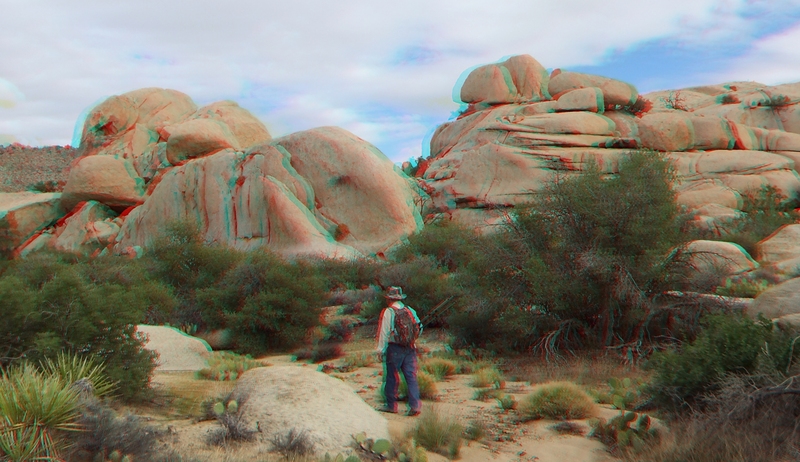 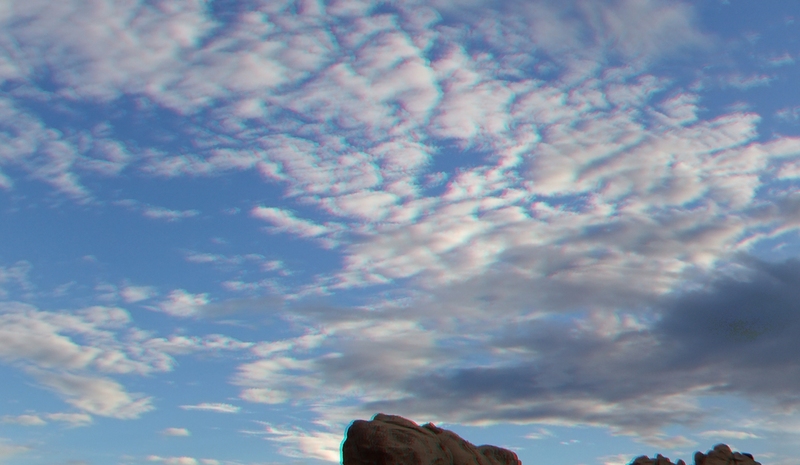 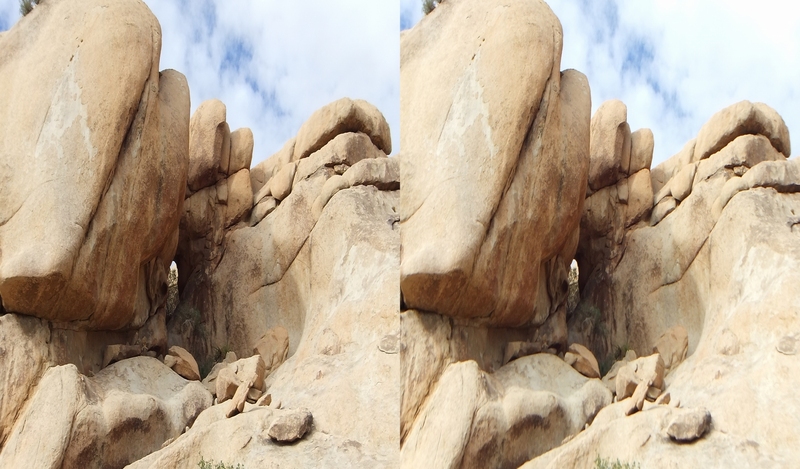 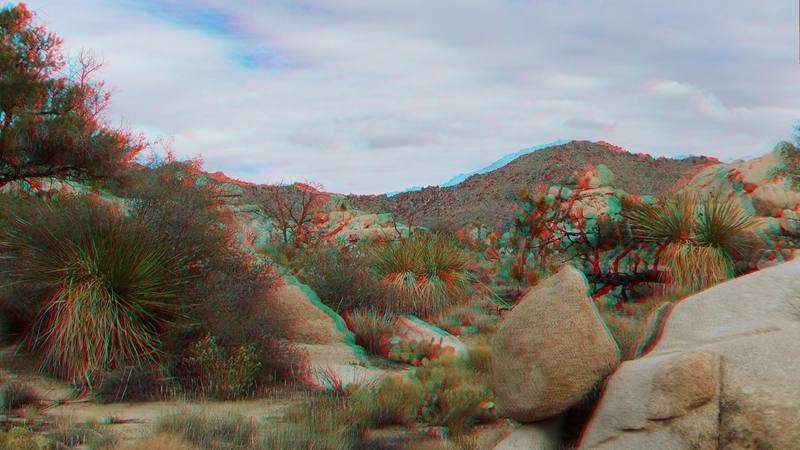 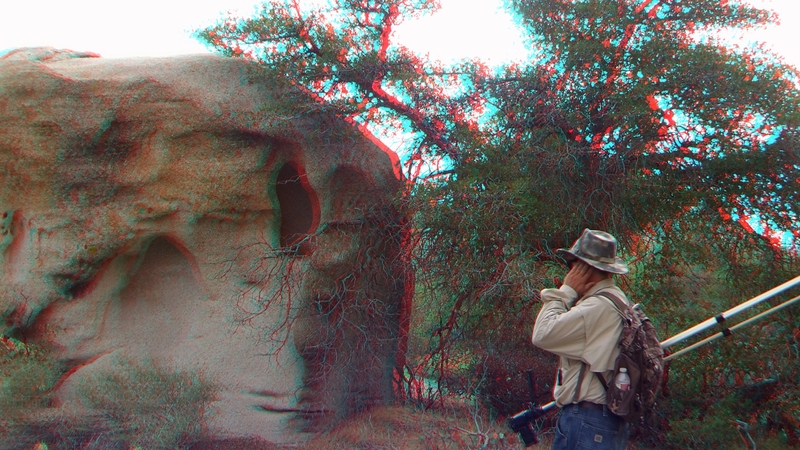 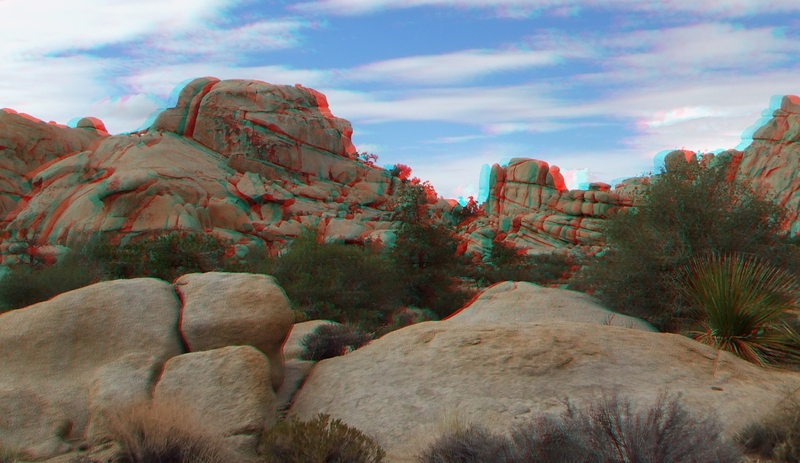 Thank you for visiting Garrett’s Arch on Joshuatree3D, and I hope you found the subject matter intriguing. 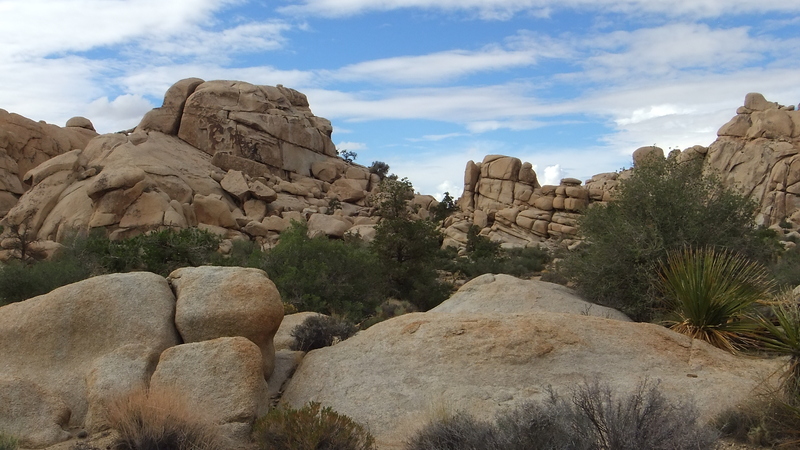 Perhaps one day you will take this enjoyable walk through the Wonderland of Rocks.